Stay up-to-date on the events and happenings at LOLC by accessing the very latest news and highlights. Read more about the group's latest financial ventures, corporate achievements and special events, as well as to avail yourself of information relevant to any new products and services offered by LOLC. 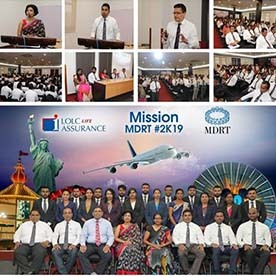 The inaugural "Mission to MDRT" programme took place at the LOLC Auditorium recently. The session was conducted by veteran trainer, Mr. Suranjith Godagama and the training consisted of special activities including experience sharing in order to encourage participants to achieve their MDRT goals in 2019. The Memorandum of Understanding was signed by LOLC Life Assurance Head of Sales, Mrs. Nadika Opatha and Regional Development Bank, General Manager / CEO, Mr. T. A. Ariyapala at the Head Office premises of the Regional Development Bank in the presence of the senior management members of both organisations. 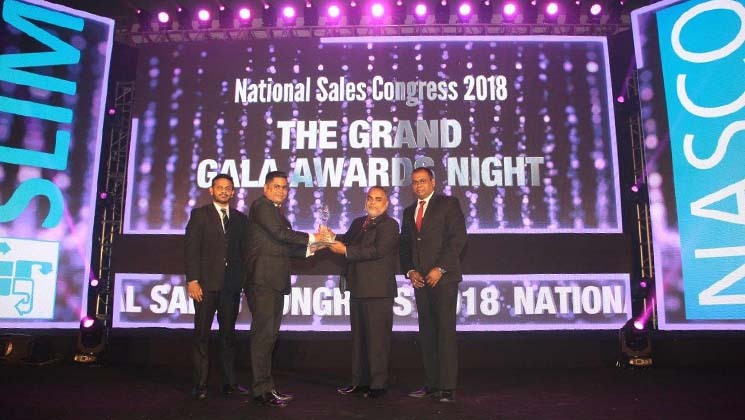 LOLC emerged as one of the biggest winners at this year's National Sales Congress Awards (NASCO) by securing two prestigious accolades including the Gold Award in the National Sales Manager Category. The SLIM NASCO is organised by the Sri Lanka Institute of Marketing (SLIM) & held for the 18th consecutive year. This year, NASCO Introduced three different categories of which the National Sales Manager category was the looked forward to title. LOLC Life Assurance Ltd Mrs. Nadika Opatha, secured the overall Gold of this category which was selected irrespective of the industry they represent. The trophy was presented by the Minister of Housing and Construction, Hon. Sajith Premadasa. Commenting about her victory, Mrs. Nadika Opatha said, "At LOLC we are nurtured and encouraged to think outside the box, with a continuous focus on a forward thinking attitude and excellence to all that we do. This support and encouragement of the LOLC Group and its management lead me to this victory in addition to my commitment and passion for my role at LOLC Life Assurance. It is hugely satisfying to be recognised for my achievement". 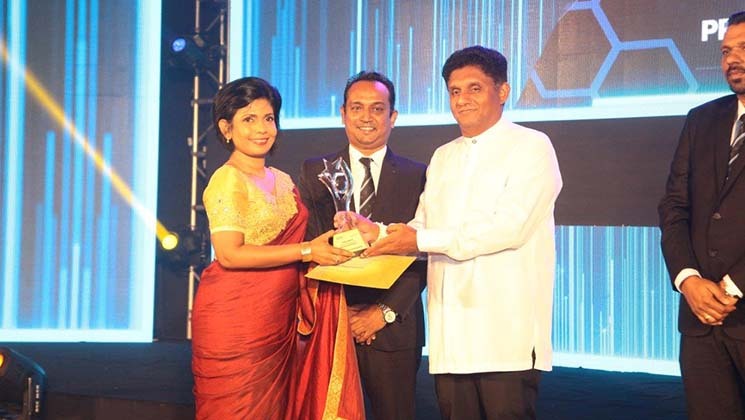 Mr. Lalindra Rupasinghe, Senior Executive, Business Development (Broker and Partnerships) of LOLC General Insurance too claimed a top accolade during the glittering awards ceremony Mr. Rupasinghe clinched the Silver award for Front Liner, General Insurance. He added, "It is an honour to be recognised at such a prestigious event. I would like to share this moment with the entire sales and marketing force of LOLC General, who truly helped to reach my full potential,". Over the last 17 years, SLIM NASCO has risen to become the pre-eminent awards, which recognises and rewards the sales forces of companies and industries, across Sri Lanka. As a national level event organised annually, SLIM NASCO creates motivation, training and learning opportunity and self-development for sales personnel as a core element of its Awards. This year about 900 professionals from the sales and marketing fraternity, representing various corporates participated at the awards presentation night. 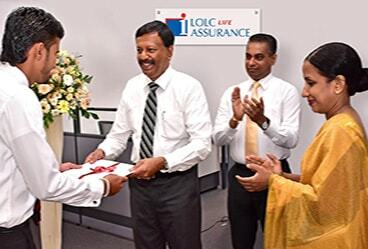 Chief Operating Officer of LOLC Insurance, Mr. Nilanga Wickramasinghe said, "I am truly pleased and honoured that two top performances of LOLC Insurance have been recognised in this manner. And I am delighted that as the Insurance arm of the dominant LOLC Group, we have been able to achieve this feat within just a few years of operations. This reflects the dedication, competitive spirit and the fortitude of our team. Both, LOLC General Insurance and LOLC Life Assurance follow a customer focussed strategy, backed by the strength and stability of the LOLC Group. Our people are the backbone of the company and together we continue to forge ahead with a vision to become the most innovative, customer focussed insurance service provider of Sri Lanka. These accolades will undoubtedly motivate our entire staff further and to fulfil their potential,". LOLC which began as a non-bank financial institution has rapidly yet sustainably evolved to become one of the largest and most diversified conglomerates in Sri Lanka. LOLC Group’s meteoric rise to become one of the nation's most profitable entities is a result of the talents, commitment and dynamism of its people. LOLC believes that its people have been the key differentiator in achieving sustained growth over the years. Therefore, the Group continues to foster and focus on its people, their service orientation, integrity and loyalty which are the hallmarks of its culture. Mrs. Nadika Opatha, Head of Sales of LOLC Life Assurance receiving the National Sales Manager Award from the Minister of Housing and Construction, Hon. Sajith Premadasa. Mr. Lalindra Rupasinghe, Senior Executive, Business Development (Broker and Partnerships) of LOLC General Insurance receiving the Silver Award for Front Liner, General Insurance. LOLC General Insurance joined hands with Ikman Compare by entering into a Memorandum of Understanding to offer Motor Insurance solutions to customers of ikman who are in pursuit of a quick and easy way to get value for money for their vehicle insurance policy. 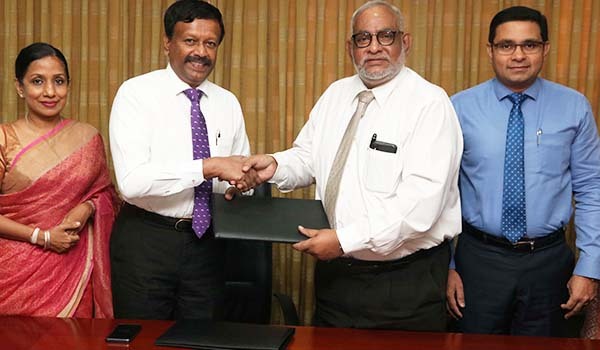 The Memorandum of Understanding between the two organisations were signed at the head office premises of Commercial Bank in Colombo in the presence of LOLC Group Managing Director/CEO Kapila Jayawardena, LOLC Group Executive Director Kalsha Amarasinghe and Commercial Bank CEO Jegan Durairatnam. Other senior management members of both organisations were also present. 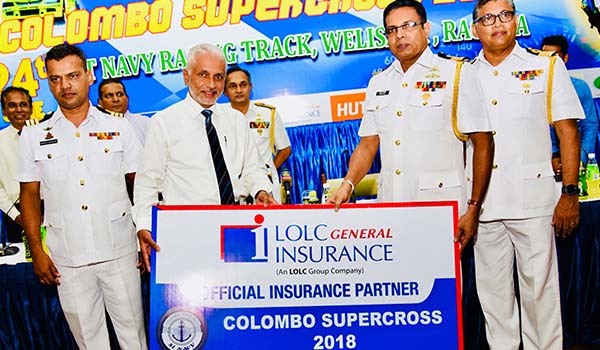 LOLC Insurance continues to partner the exciting Motor Racing arena and signed up as the official Insurance Partner for the upcoming Colombo Supercross 2018. 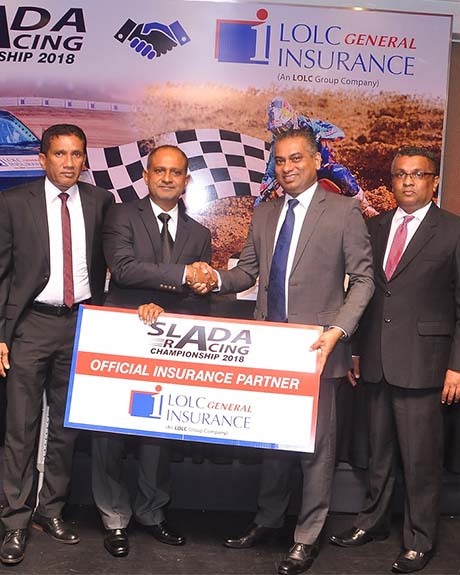 The dynamic Insurance arm of the LOLC Group, LOLC Insurance will serve as the National Insurance Partner of the 2018 Supercross event calendar of the Sri Lanka Autosports Drivers Association (SLADA). The sponsorship cheque was officially presented by Mr. Nilanga Wickramasinghe, Chief Operating Officer of LOLC Insurance to Mr. Sanjaya Kariawansa, the President of SLADA, at an event held recently. Speaking at the event, Mr. Nilanga Wickramasinghe, the Chief Operating Officer of LOLC Insurance said, "We are delighted to sponsor the exciting and immensely popular event calendar of SLADA this year and we regard this sponsorship as an opportunity to further build LOLC General Insurance as a trusted and reliable brand name in the motor insurance industry of Sri Lanka. We were honoured to play a significant role at the recently concluded &apos;Foxhill Supercross&apos; which we sponsored for the first time. It is a pleasure to be working with SLADA as well as the accredited racing bodies of the country. We look forward to the upcoming motor racing events and hope to collaborate and continue to partner with SLADA whilst establishing LOLC Insurance as a trusted brand, be it on the road or at the circuit", he added further. 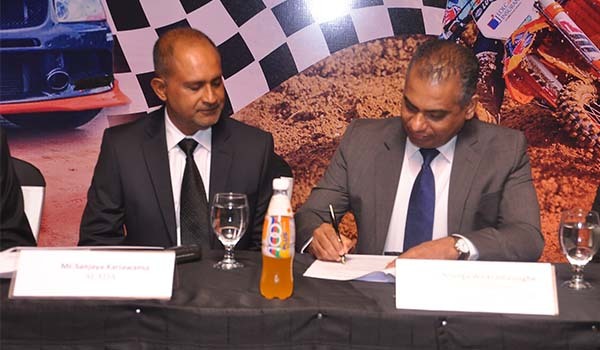 SLADA is known to bringing the best of action to Sri Lankan motorsport enthusiasts. The elite racing club hosts four of Sri Lanka&apos;s leading racing competitions and one circuit meet annually. From the &apos;Fox Hill Supercorss&apos; held in the beautiful hills of Diyathalawa to the &apos;Gunners Supercross&apos; and &apos;Gajaba Supercross&apos; held in the great Sri Lankan ancient Kingdoms of Anuradhapura and Minneriya, SLADA hosts Sri Lanka&apos;s most looked-forward-to events in the motorsports calendar. Taking motorsport to the next level, SLADA recently introduced Moto GP and Motor Car Grand Prix events at the Rotherham Katukurunda circuit meet. The SLADA event calendar this year is lined up with a series of challenging racing events starting with the Sigiriya Rallycross on the 26th and 27th of May followed by the Gunners Supercross on the 28th and the 29th of July, the Gajaba Supercross on the 18th and 19th of August and finally the Rotherham Katukurunda race on the 6th and 7th of October. A fully-owned subsidiary of the LOLC Group, LOLC General Insurance Limited is currently one of the fastest growing insurance companies in Sri Lanka. The company offers a comprehensive range of insurance solutions to both individuals and businesses with products such as Motor insurance, &apos;Sureki Piyasa&apos; Home Insurance, Engineering Insurance, Travel Insurance, Title Insurance, Shop Insurance, and much more. Renowned as one of Sri Lanka&apos;s fast-growing Life Insurance companies, LOLC Life Assurance too is a fully owned subsidiary of the LOLC Group. The company offers tailor-made Life Insurance Solutions ranging from &apos;Sureki Daru&apos; Child Insurance, Life Protect, Life Protect Plus, Reality Plan, &apos;Piyawara&apos; Pension Plan and Home Loan Protections. 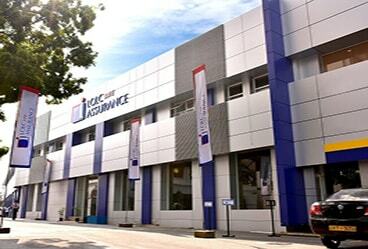 Both LOLC Life Assurance and LOLC General Insurance leverages on LOLC Group&apos;s strong distribution channel. The sponsorship cheque was presented to Mr. Sanjaya Kariawansa, President of SLADA by Mr. Nilanga Wickramasinghe, Chief Operating Officer, LOLC Insurance. Mr. Sanjaya Kariawansa, President of SLADA and Mr. Nilanga Wickramasinghe, Chief Operating Officer of LOLC Insurance, signing the MOU. 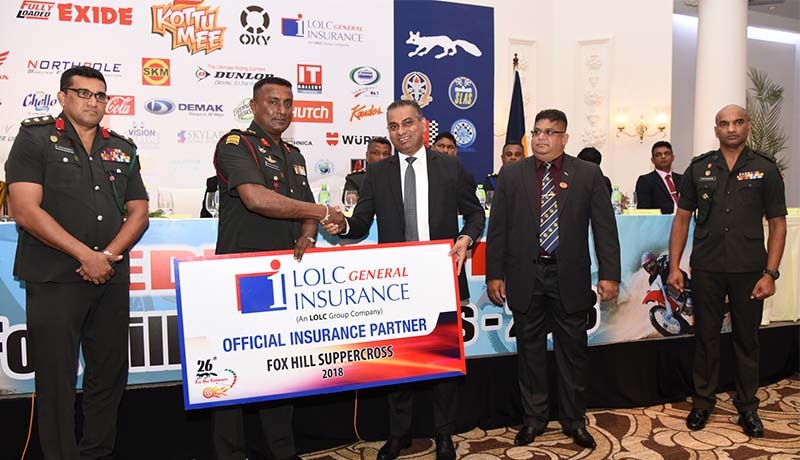 LOLC General Insurance Limited signed up as the official Insurance Partner for the upcoming 26th Fox Hill Supercross 2018. 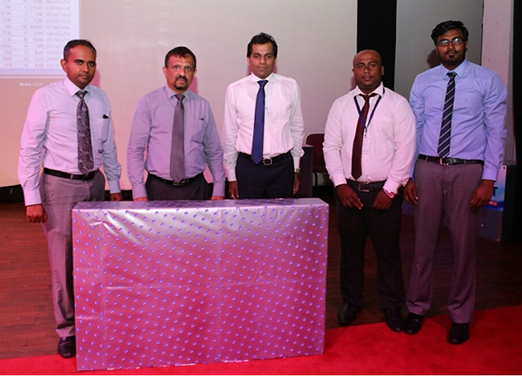 The sponsorship cheque was officially handed over recently at the "Jubilee Ballroom" Galle Face Hotel, Colombo. The cheque was presented by Mr. Nilanga Wickramasinghe - Chief Operating Officer - LOLC - Insurance to the Brigadier H.H.S.P.K. Senarathna RWP Commandant of Sri Lanka Military Academy, Diyathalawa. All four properties of Browns Hotels & Resorts have lined up exciting programmes this season ranging from Christmas eve gala lunch and dinner buffets, fireworks, music, raffle draws and amazing giveaways, Christmas carols, fun-packed games, new year&apos;s eve lunch and dinner and many more sensational surprises. The beautifully lit up atmosphere of each property of Browns Hotels & Resorts located in four distinctive locations in the island will add to the festive cheer. 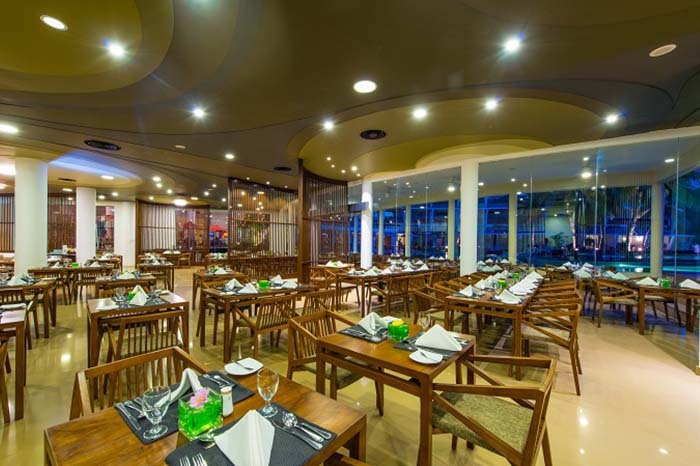 All this is complemented with the wide assortment of food and drinks prepared by the world class chefs of each resort. 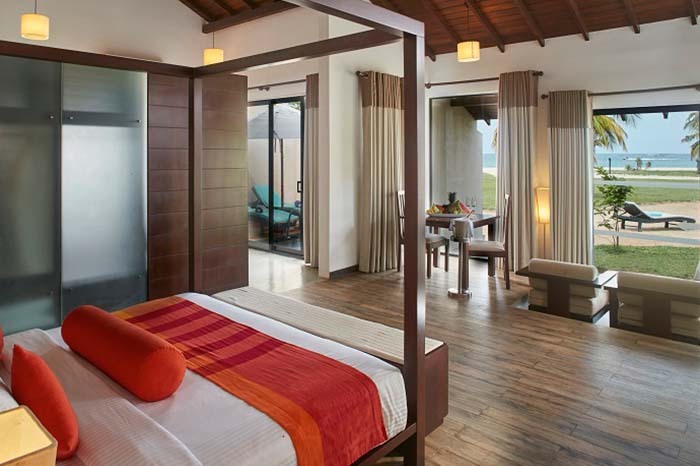 The calm waters of The Calm Resort & Spa in Passikudah is the perfect destination to unwind in sophisticated charm. Guests at The Calm Resort can take a stroll on one of the world&apos;s longest stretches of shallow coastline, and take part in thrilling water sports activities or visit a range of local attractions located mere hours away from the property. The Paradise Resort & Spa in Dambulla is a lavish fusion of local heritage as it is enchantingly positioned deep inside the nation&apos;s cultural triangle. This year, The Paradise Resort & Spa too is beautifully decked, adding much magic and splendour to the festive season ahead. Al-Falaah, the Islamic business unit of LOLC Finance PLC took top honours at the 2nd consecutive Islamic Finance Forum of South Asia (IFFSA) Awards 2017, held in Colombo Sri Lanka. The event was organised by UTO EduConsult in conjunction with KPMG adjudication. LOLC Al-Falaah took home the night s top accolades including the Silver award for the Entity of the year, where the Gold was clinched by Meezan Bank of Pakistan and Bronze by Dubai Islamic Bank of Pakistan. Further, LOLC Al-Falaah won metals in the categories of Window/Unit of the year and CSR Project of the year for which it won Gold and Silver awards respectively. The second edition of this regional awards presentation, recognised industry players from countries across the South Asian region including India, Pakistan, Bangladesh, the Maldives and Sri Lanka. The IFFSA awards were evaluated and assessed by a panel of independent judges of repute and were presented country-wise with a few awards bestowed on intra-regional basis. This year s awards ceremony was held under the theme, "Cooperation, Consolidation and Concentration". Mr. Krishan Thilakaratne, LOLC Group Head of Islamic Finance, commenting about the win said, "the IFFSA Awards is a competitive process where awards are given to entities servicing the South Asian Islamic Banking and Finance market (IBF), and the honours bestowed upon LOLC Al-Falaah demonstrates the efforts and the pivotal role we play in the Islamic Finance (IF) industry of Sri Lanka. Today, LOLC Al-Falaah plays the lead role in Islamic SME and Microfinance business and we have taken significant measures to take the IF concept to the rural areas. The success of LOLC Al-Falaah is the result of our fully compliant business model, our comprehensive Islamic Finance product portfolio and LOLC s brand strength. In addition to this, the efficient processes driven by the advanced technological platform has made Al-Falaah an unparalleled player in the industry". Mr. Shiraz Refai, Deputy General Manager, Al-Falaah Islamic Business Unit of LOLC Finance said, "the recognition we received at the 2nd IFFSA awards pay tribute to the commitment and dedication of our staff. The awards bestowed upon LOLC Al-Falaah at a time when it is celebrating the 10th anniversary will certainly motivate the team to further push the boundaries of excellence". Al-Falaah, established in 2007 functions directly under the auspices of LOLC Finance PLC, which is one of Sri Lanka s largest non-banking financial institutions. LOLC Finance which is a regulated Finance Company of the Central Bank is rated [SL] A with stable outlook by ICRA Lanka Limited, a wholly owned subsidiary of ICRA Ltd - an associate of Moody s Investors Service. LOLC Group Head of Islamic Finance - Krishan Thilekaratne receiving the "Gold award for the Window/Unit of the year" from Group MD/CEO, Adl Capital - Ishrath Rauff. The Silver award for the CSR Project of the year award received by Senior Executive - Channel Marketing - Rishard Muhammad from Founder & Chairman, The Citizens Foundation (TCF) Pakistan - Mushtaq Chhapra. Shafin Iqbal - Senior Executive - Institutional Marketing, Imran Zarook - Senior Executive - Recoveries Supervision, Ramzi Majeed - Senior Executive - Operations and Rishard Muhammad - Senior Executive - Channel Marketing of Al-Falaah Islamic Business Unit with the LOLC Group Head of Islamic Finance - Krishan Thilekaratne. 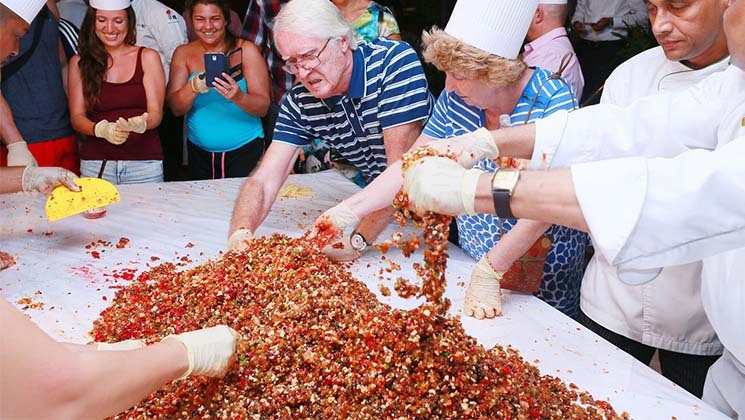 Merry-making at the Eden Resort & Spa Annual Christmas cake mixing ceremony. 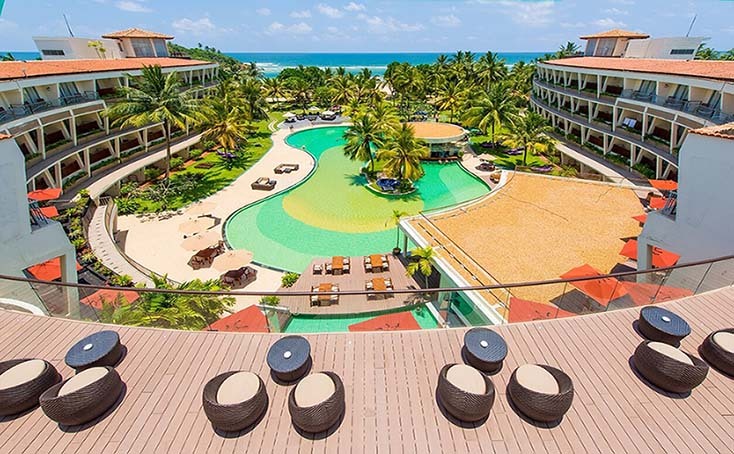 Beautifully positioned on the pristine coastline of Beruwela, The Eden Resort & Spa is an ultimate beach paradise that provides an out of the world experience to its customers to unwind in the southern coast of Sri Lanka. Eden operates under Browns Hotels and Resorts which boasts a rich history of over 20 years in the hospitality industry of Sri Lanka. Recognised as a TripAdvisor® Certificate of Excellence Hall of Fame winner, Eden Resort & Spa offers 158 elegantly furnished luxury rooms, suites and penthouses and an exclusive spa. This has earned the hotel the prestige of being the first 5-star hotel in Sri Lanka to offer spa facilities. The hotel was also awarded with the prestigious ISO 22000:2005 certification in relation to food safety and food quality standards. 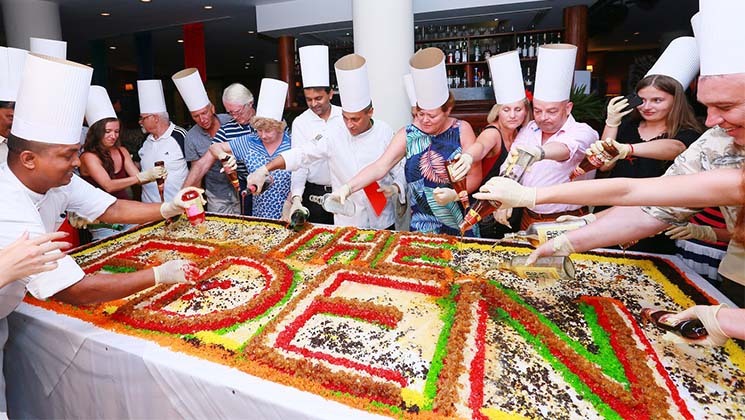 In-house guests, invitees and the staff of Eden Resort & Spa taking part in the annual cake mixing ceremony 2017. The Global Banking & Finance Review Award for the Best Brokerage Research House in Sri Lanka 2017 was awarded to LOLC Securities Limited (LOSEC), the stock broking company of the LOLC Group. With this latest accolade, LOSEC becomes one of the most awarded research team in the broking industry of Sri Lanka, over the last few years. It is noteworthy that LOSEC clinched the &apos;Best Brokerage Research House, Sri Lanka award&apos; - a category which was introduced for the first time in the country by the Global Banking & Finance Review. Established in 2011, and now a fully owned subsidiary of the LOLC Group, LOLC Securities has been built for excellence in all its dimensions, keeping in mind the assurance sought by discerning investors. The company has devised a new operational model centered on the investors&apos; portfolio management strategy to ensure that LOSEC&apos;s investment advice is backed strongly by an in-house advanced research team of highly qualified analysts. The market reports compiled by LOLC Securities are detailed and analytical and offer valuable insights into market and economic trends and statistics. LOSEC&apos;s subsidiary company, LOLC Capital One established about a year ago, is a boutique investment bank which provides advisory services for mergers and acquisitions, debt capital markets and alternative investments. Sharing his thoughts about the achievement, Sriyan Gurusinghe - CEO/Managing Director of LOSEC said, "Being recognized as the top brokerage research house in the country is a great accomplishment achieved by LOLC Securities Research Division. I&apos;m extremely pleased and take humble pride of our experienced research team and expect they will continue to provide research with valuable investment insights to our clients to grow their wealth while helping to move the company towards the pinnacle of success." Shehan Bartholomeuz, the Research Head of LOSEC added, "LOLC Securities has over the years set the benchmark in equity research in Sri Lanka with unwavering focus in catering to the research needs of a wide range of clients from retail, institutional to foreign. The innovative culture we have inculcated in our team since the inception, has resulted in driving our analysts to continuously improve and innovate, creating unique research products to capture vagaries in a frontier market like Sri Lanka. It is very humbling to see the prestigious global financial magazine "Global Banking and Finance Review Magazine" recognizing us, cementing LOLC Securities&apos; place as an industry leader in equity research." Commenting, Senior Research Analyst of LOSEC, Gayan Rajakaruna said, "As an analyst at LOLC Securities, I am delighted and encouraged by being recognised by the "Global Banking and Finance Review Magazine" as the top brokerage research house in the country. Our strong team effort and the drive for producing high quality investment research were perhaps the key factors of paving the way to such accolade. We will continue to provide unbiased and investor-oriented research opinions through more in-depth and timely research to address a larger range of client needs". The Global Banking & Finance Review is among the world&apos;s leading online and print magazines, which has evolved from the growing need to have a more balanced view, for informative and independent news within the financial community. (L-R) Senior Research Analyst Gayan Rajakaruna, LOSEC Chief Operating Officer Manjula Kumarasinghe, Research Intern Subhanie Tennekoon, LOSEC Chief Executive Officer/Managing Director Sriyan Gurusinghe, Associate Research Analyst Hiruni Perera and Head of Research Shehan Bartholomeuz. Both LOLC General & LOLC Life are now geared to serve the nation from one location. LOLC General Insurance Limited, one of Sri Lankas fastest growing insurance companies recently relocated their head office to a modern and spacious premises located at No. 481, T. B. Jaya Mawatha (Darley Road), Colombo 10. 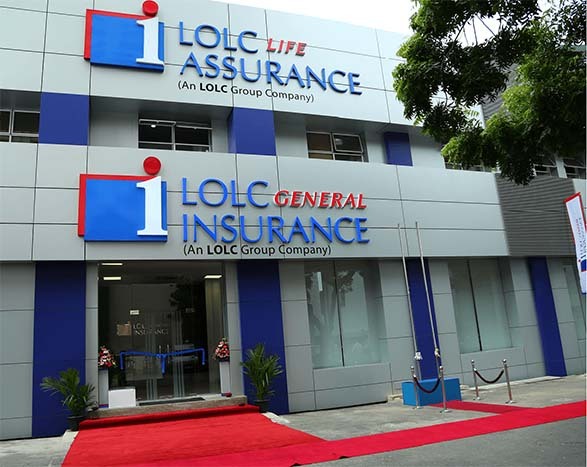 Strategically situated in a prime, business location in Colombo, LOLC General Insurance relocated to the same premises as LOLC Life Assurance and the two entities are now geared to offer greater convenience to its customers from the new head office complex. LOLC Group Managing Director/CEO, Kapila Jayawardena graced the inauguration ceremony as the Chief Guest together with Mrs. Kalsha Amarasinghe, Executive Director of LOLC. 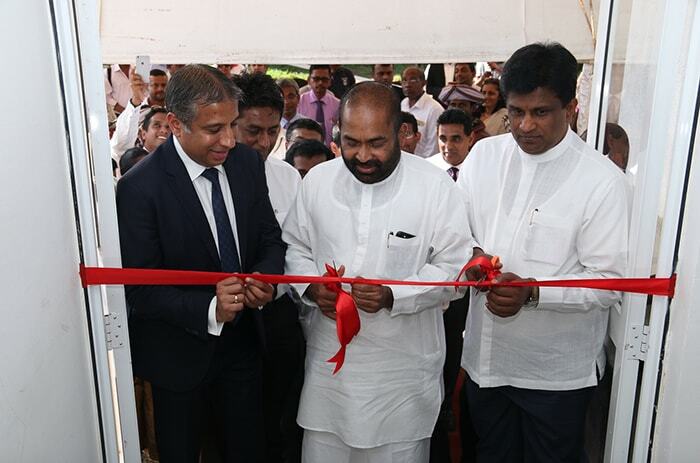 The new head office complex was declared open amidst a gathering of Directors and Senior Management of LOLC Group, COO of LOLC Insurance - Nilanga Wickramasinghe, company staff and well-wishers. Addressing the gathering at the opening ceremony, LOLC Group Managing Director/CEO, Kapila Jayawardena said, "In just 6 years of operations, today LOLC General Insurance is moving to its own corporate office; moreover, to the same premises as LOLC Life Assurance. This is a great achievement for LOLC General Insurance as it will open up new avenues of growth, expand its presence in the insurance industry and deliver a superior level of service to its customers." Nilanga Wickramasinghe, COO of LOLC Insurance added, "The relocation to a brand new, modern and spacious working environment will further boost the enthusiasm and efficiency of our staff and with this new move, LOLC Insurance will continue to offer an array of exquisite products and services, all under one roof. We believe in best care for our staff, so that as a result they will always be with an attitude to provide the best services to our customers." LOLC General Insurance offers a comprehensive range of bespoke insurance solutions to both individuals and businesses with products such as motor insurance, engineering insurance, travel insurance, title insurance, shop insurance, Sureki Piyasa home insurance, and much more. LOLC General Insurance understands the needs of the customers and its experienced and professional sales force is geared to meet the personal and commercial needs of their clients throughout the country whilst offering best of benefits, flexible terms and competitive pricing. Both LOLC Life and LOLC General leverages on the Group&apos;s strong distribution channel of 173 outlets to expand its market share. Since its inception in 2011, the company has been experiencing rapid and sustainable growth and has expanded its product portfolio ever since. LOLC Group Managing Director/CEO, Kapila Jayawardena receiving the first set of business proposals from a member of the LOLC General Insurance sales force, at the new LOLC Insurance Head Office premises. Also in the picture are (from left to right) Sujeewa Vidanapathirana, DGM, Business Development - LOLC General Insurance, Dharini Fernando, COO, LOLC General Insurance, Kalsha Amarasinghe, Executive Director of LOLC and Nilanga Wickramasinghe, COO, LOLC Insurance. The new head office premises of LOLC General Insurance and LOLC Life Assurance located at No. 481, T. B. Jaya Mawatha (Darley Road), Colombo 10. 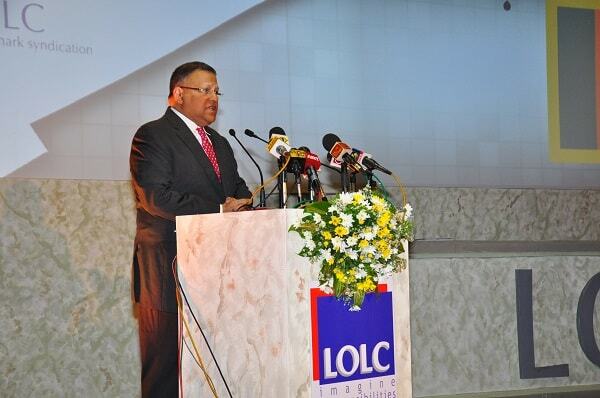 LOLC Group Managing Director/CEO, Kapila Jayawardena ceremonially opening the new LOLC General Insurance head office. Also seen in the picture is Kithsiri Gunawardena, COO - LOLC/Chief Legal Officer - LOLC Group. 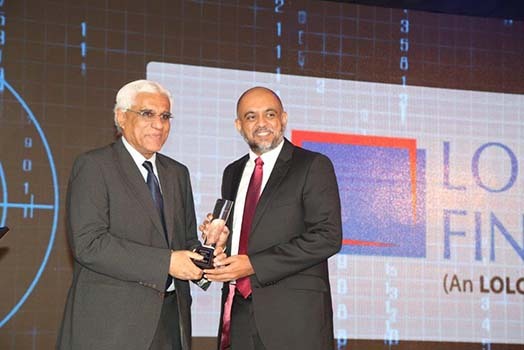 LankaPay Technnovation Awards, an initiative of Lanka Clear, the operator of the national payment network is an effort to enhance the efficiency of the country&apos;s national payment infrastructure and promote the use of electronic transactions. The awards recognise member banks and non-banking financial institutions who have excelled in electronic transactions during the financial year starting 1st April 2016 to 31st March 2017. 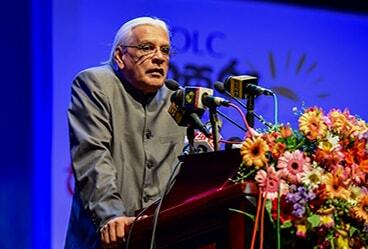 Central Bank of Sri Lanka Governor Dr. Indrajit Coomaraswamy graced the occasion as the Chief Guest. Commenting about the achievements at the first ever LankaPay Technnovation Awards, Director/CEO of LOLC Finance, Mr. Ashan Nissanka said, "Winning three prestigious awards at the LankaPay Technnovation Awards 2017 clearly demonstrates that our customers have come to embrace our value-added payment process and that it is well accepted in the industry purely due to its hassle-free and user friendly features. This is also an honour bestowed upon us that pays tribute to the expertise and dedication of our team of professionals". Mr. Nissanka further stated, "Through our sustained focus on innovation, we continue to lead the market with a range of value added services, thereby engaging with our customers more than ever before and offering them the very quintessence of convenience. Our vision is to become a truly customer centric organisation that is on par with any international bank or NBFI, by adopting digitalisation because we believe that digital services have become the preferred means of interaction between customers and their financial institutions. Digitalisation has helped us to know our customers better and to offer them truly personalised products and services. We are ever so vigilant of our customers&apos; needs and move with the times to provide them with the latest and best in the industry. At LOLC Finance, our business model is driven by trust and confidence, underpinned by close customer relationships which helps us to forge ahead as a leading Financial Institution in digital transformation". Mr. Conrad Dias, LOLC Group&apos;s Chief Information Officer said, "In the 2015/2016 financial year, the total number of instant transactions through LOLC Real Time was 3,257. 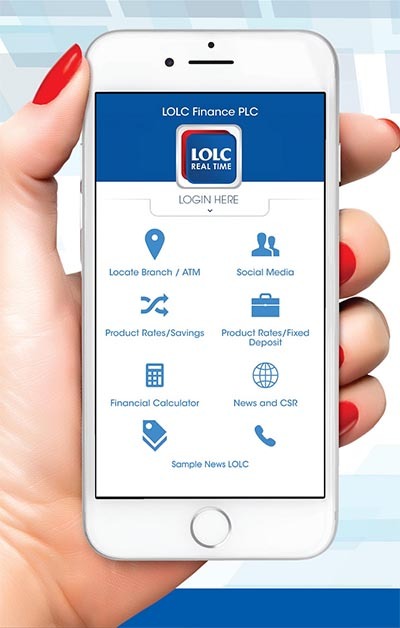 However, this has surged tremendously in the last financial year to 28, 394 transactions.These statistics as well as the recent wins at the Technnovation Awards prove that LOLC Real Time is now immensely popular amongst customers as it is not only a convenient tool that offers direct and easy access to our customers&apos; LOLC Finance accounts but it is also designed on a scalable architecture that complies with the highest levels of information security standard. We also have USSD base option specially catering to our micro financing customers who are not using smart devices. Moving further, we hope to introduce the ability to utilise pre-approved loans online and implement trilingual support for the convenience of customers.We also hope to introduce the low value payment for merchants facilitated through Justpay from Lanka Clear and integrate it to LOLC Real Time". LOLC Real Time, the fully integrated, online payment platform of LOLC Finance enables customers to send and receive money, instantly via CEFTS (Common Electronic Fund Transfer Switch) and SLIPS (Sri Lanka Interbank Payment System). These mobile and internet banking solutions offer unparalleled convenience to customers who seek a superior level of speed, ease and security. Through LOLC Real Time, customers are able to transfer funds directly and instantly from their LOLC Finance Savings account to any account of the recipient, with the use of any device. Some of the solutions that are offered for the convenience of customers through this user friendly mobile app includes, checking of personal account balances and transaction history, payment of utility bills, transferring of funds in real time, monitoring expenses, scheduling postdated business transactions and instructing standing orders. Furthermore, all this can be done at absolutely no cost. This service is also supported by a 24-hour call centre which is equipped to handle customer enquiries on LOLC Real Time as well as ATM registration and other enquiries. Customers can register at any LOLC Finance branch to access the services of LOLC Real Time. LOLC Finance takes pride in claiming to be the first financial institution in the country to enable instant fund transfers and the first to introduce CEFTS transfers through a mobile app. Mr. Ashan Nissanka, Director/CEO of LOLC Finance receiving the award for the Most Popular Electronic Payment Product from Central Bank Governor, Dr. Indrajit Coomaraswamy. (Standing from Left to Right) Mr. Channa de Silva, General Manager/CEO, Lanka Clear (Pvt) Ltd, Mr. Anil Amarasuriya, Chairman Lanka Clear (Pvt) Ltd, Dr. Indrajit Coomaraswamy, Governor of the Central Bank of Sri Lanka, Mr. Ashan Nissanka, Director/CEO of LOLC Finance, Mrs. Roshani Weerasekera, Head of Liability Management, LOLC Finance and Mr. Chinthaka Jayasinghe, Head of Business Solutions, Banking - LOLC Technologies. Sustaining its unblemished track record, LOLC Group concluded an excellent year sealed by its strongest financial performance to date. For the year ended 31st March 2017, the Group recorded PBT of 24.4Bn and PAT of Rs. 20.9Bn, an increase of 106% and 124% respectively, compared to the previous year. The consolidated gross income grew by 37% to Rs. 92Bn, while the interest income from financial services grew by 41% to Rs. 55Bn. The total assets of the Group increased to Rs. 641Bn, a growth of 69% over last year. Despite external challenges, the Group&apos;s resilient financial sector, led by the key players, LOLC Finance PLC (LOFC), Commercial Leasing and Finance PLC (CLC), LOLC Micro Credit Ltd (LOMC) and BRAC Lanka Finance PLC (BRAC) delivered a consistent strong financial performance. The Profit contribution from these companies together with the rapid penetration into microfinance in the Asian region positioned the Group at a strong level of profitability. Of the Group&apos;s profit, 81% was derived from financial services, while its strategic investments into the non-financial sectors., Leisure, Plantations, Construction, Health care, Trading & Manufacturing, complemented the growth. This diverse portfolio spread over a multitude of growth sectors has made LOLC one of the largest conglomerates in the country. The flagship finance company of the Group LOFC, recorded PBT of Rs. 2.2Bn, with an asset base of Rs. 123Bn, a deposit base of Rs. 81Bn and an advances portfolio of Rs. 91Bn, thus making LOFC one of the strongest and largest NBFIs in the country. CLC, a turnaround case study since its acquisition by LOLC in 2008, recorded PBT of Rs. 2.2Bn, with an asset base of Rs. 78Bn, a deposit base of Rs. 16Bn and an advances portfolio of Rs. 54Bn. LOMC, the largest private sector micro credit company in the country, achieved PBT of Rs. 2.5Bn with an asset base of Rs. 63Bn and an advances portfolio of Rs. 50Bn. LOMC has made its name in the global microfinance arena with its unique business model that sets itself apart from conventional microfinance models. INSEAD business school, France, included LOMC as one of the case studies in their MBA program following an independent study on the company&apos;s remarkable performance, commitment to empowering women and communities, and outstanding social stewardship reflected in their business model. It is also the first and only Sri Lankan Microfinance Institution to be awarded Client Protection Principles Certification from the SMART Campaign. BRAC achieved significant financial performance in the current year with PBT of Rs. 352.7Mn with an asset base of Rs. 13Bn, a deposit base of Rs. 3Bn and an advances portfolio of Rs. 11Bn. BRAC was able to replicate the LOLC&apos;s micro business model and operational processes effectively in achieving this superior performance. Seylan Bank, an associate company of the Group contributed well to the Group&apos;s financial performance with a contribution of Rs. 1.4Bn as profits. The Group&apos;s Insurance businesses, LOLC Life Assurance and LOLC General Insurance, has performed well during the year, positioning itself among the top 10 players in both general and life business in terms of Gross Written Premiums in less than 4 years of operations. The general business contributed Rs. 310Mn as profits, while the Life business recorded a Rs. 320Mn as surplus during the last financial year. LOLC ventured into the Asian region with its globally acclaimed microfinance model, and the footprint now stands in Cambodia, Myanmar and Pakistan, with a few more strategic locations identified in the pipeline. PRASAC, the maiden overseas investment of LOLC and the largest microfinance institution in Cambodia, has achieved unprecedented performance since our initial investment in 2007. PRASAC grew its asset base by 260 times to Rs. 210Bn, 90 times in profitability to Rs. 7.8Bn and 100 times growth in its advances portfolio to Rs. 172Bn while maintaining a low 30 days NPL ratio of 1.16%. Anticipating further value addition from this investment, LOLC Group increased its holding from 22.25% to 70% recently. Hong Kong based, Bank of East Asia (BEA) partnered LOLC Group in this transaction and holds 21% of the Company. PRASAC is now set to transition into a fully-fledged commercial bank in due course. LOLC Cambodia PLC, the 4th largest micro finance institution in Cambodia, made significant contribution to the Group&apos;s profit with Rs. 2.5Bn holding an asset base Rs. 42Bn, a deposit base of Rs. 5Bn and an advances portfolio of Rs. 36Bn. LOLC Myanmar, the greenfield operation established in 2013, has demonstrated remarkable growth, reaching profitable status in just 4 years since commencement of business. The profit contribution to the Group was Rs. 61Mn with an asset base of Rs. 2Bn, a deposit base of Rs. 460Mn and an advances portfolio of Rs. 1.6Bn. LOLC was the first Sri Lankan organization and the fourth international operator to commence operations in the Myanmar financial sector. This year, in recognition of LOLC&apos;s distinctive microfinance model, State Government of Pakistan and the Sultanate of Oman, invited LOLC to take up the major shareholding of their joint venture - Pak Oman Bank Pakistan. Through its new partnership with LOLC, Pak Oman Microfinance Bank hopes to capitalise on the specialty of LOLC&apos;s unique Microfinance model which transforms and enables Micro businesses to become Small and Medium level enterprises through sustainable industrialization. Aligning itself with the growth sectors of the Sri Lankan economy, LOLC Group has also been a catalyst in the development of the Non-Financial Sector through Brown and Company, a 142-year old conglomerate with exposure in leisure, agriculture & plantation, power generation, marine and manufacturing, home and office solutions, pharmaceuticals and healthcare. The Battery Division performed with its renowned brands such as EXIDE, LUCAS and Dagenite where EXIDE maintained its standing with 58% market share. The Agriculture Division fared well despite adverse weather conditions with its strong brand portfolio including Massey Ferguson and Yanmar, while TAFE tractors, the premier brand in the portfolio, maintained 55% of market share over the financial year. As a value addition to the Agriculture portfolio, AgStar, one of the largest fertilizer companies in the country, in its product proposition and performance complements well to the Group&apos;s business. The marine division, with global marine brands like Hyundai, Yanmar, Tohatsu and Isuzu, affirmed its position, with 51% market share. Browns Thermal Engineering recorded 54% market share as the only radiator manufacturer in the country. Displaying resilience in the face of testing external market conditions such as low priced imports on veterinary products, veterinary division grew by 34% in sales. The Pharmaceuticals division expanded their product portfolio into the Human Pharma segment with nutraceutical products introduced in the year under review. Browns hospitals celebrated its second year as the only hospital with an ISO 9001:2015 certification on quality, recorded steady growth in business with significant progress with it&apos;s in house patient care facilities. In line with the Group&apos;s dynamic investment management process, the Group divested two of its plantations, Agalawatte and Pussellawa, in the year under review with significant returns to shareholders. In the meantime, the restructuring strategy adopted by the Group with the entry into the plantation sector, saw strong operational performance at Maturata plantations. Galoya Plantation continues with its sugar production and is venturing into other value added services in the medium term. The construction arm of the group, Sierra, too completed a notable year with a profit contribution to the LOLC Group of Rs. 493Mn. 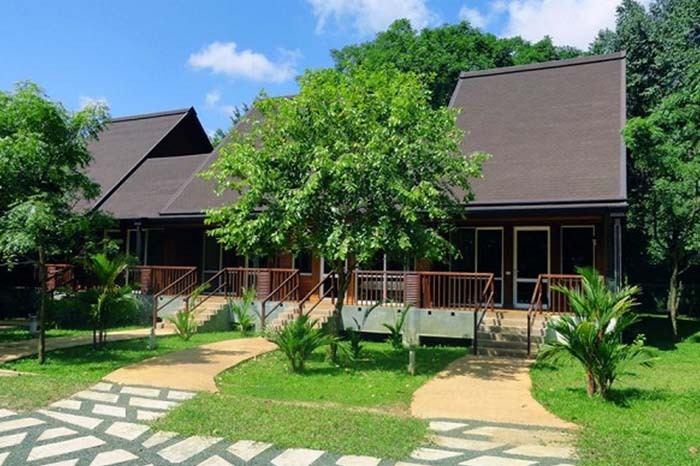 The Group&apos;s Leisure portfolio made steady progress, holding 4 operational hotels: Eden Resort and Spa in Beruwela, Paradise Resort and Spa in Dambulla, Dickwella Resort and Spa in the deep south and Calm Resort in Pasikudah. 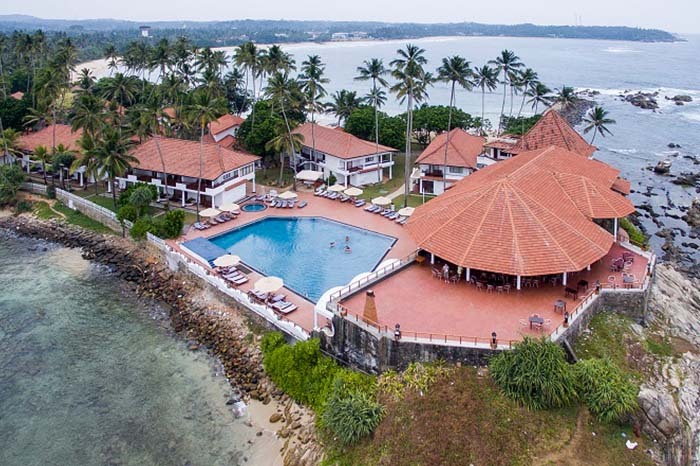 The pipeline is promising with international strategic partners onboard, Sheraton partnering with Turtle Beach Kosgoda to be opened in 2017, while Club Mediterrane, France will take over the management in Riverina Beruwala, which once completed will be one of the largest resorts in the country. This year marked the Group&apos;s first overseas leisure venture, with the North Male Resort Development project in partnership with State-owned China Machinery Engineering Corporation (CMEC), where LOLC is pioneering the creation of three islands on lagoons in Maldives with one 5-star and two 4-star properties. 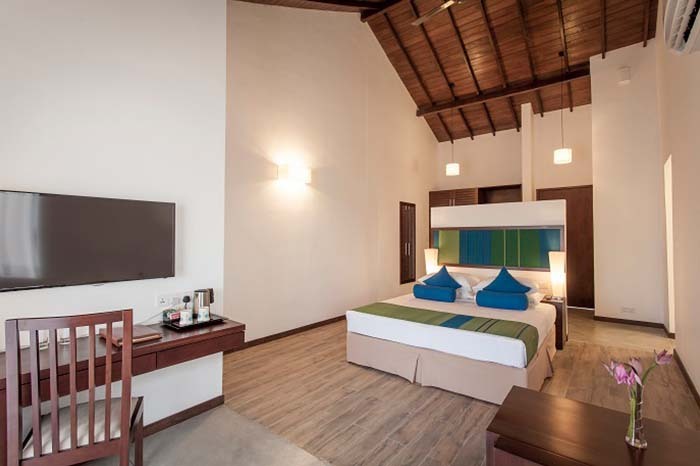 LOLC&apos;s other projects in the Maldives are the Nasandhura Hotel and Apartment Complex in the Male city with 135 room keys and 118 apartments, development of a 5-star resort in Bodufaru in Raa Atoll and a 4-star resort in Bodufinolhu in South Ari Atoll. The Group&apos;s tremendous success over the year in review was validated by recognition from several independent organizations within the business community. The highlight, however, was being the overall Gold Winner of the National Business Excellence Awards, widely recognized as the pinnacle of corporate accomplishment in Sri Lanka. With the growth momentum witnessed over the last financial year, LOLC Group is poised to embrace opportunities to empower entrepreneurs in Sri Lanka and beyond. Al-Falaah, the Islamic Business Unit of LOLC Finance PLC, a subsidiary of the LOLC Group won top awards at the 6th Sri Lanka Islamic Banking & Finance Industry (SLIBFI) awards 2017 including the Gold award for being adjudged the &apos;Islamic Finance Entity of the Year. LOLC Al-Falaah also clinched the Silver award for Social Upliftment in the CSR category and the Gold award for the Best Deal of the year. 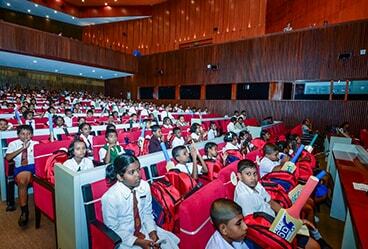 The SLIBFI awards which was held for the 6th consecutive year took place in Colombo, recently. It recognizes individuals and institutions that made significant contributions to the Islamic Banking and Finance Industry of Sri Lanka during 2016 and is hosted by EduConsult in conjunction with independent adjudicators, KPMG. The &apos;Islamic Finance Entity of the Year&apos; Gold award was received by Mr. Krishan Thilakaratne, LOLC Group Head of Islamic Finance. Speaking about the achievement, Mr. Thilakaratne said, "LOLC Al-Falaah, which is in its 10th year in operation has come a long way, not just in terms of its superior range of Shari&apos;ah compliant financial solutions and wide spread reach, but in terms of becoming the most trusted and reliable Islamic financial service provider in Sri Lanka. By clinching the top slot for the second year, we believe that Al-Falaah has made an indelible mark in the hearts of our customers and the IBF industry". Mr. Thilakaratne thanked the Shari&apos;ah Supervisory Board and LOLC&apos;s Board of Directors for their steadfast trust as well as the Staff for their commitment which he reiterated as the key reasons behind Al-Falaah&apos;s continuous achievements and superior results. Speaking about winning the Gold award for the Best Deal of the year at the 2017 SLIBFI awards, Mr. Shiraz Refai, Deputy General Manager, Al-Falaah Islamic Business Unit of LOLC Finance said, "It is a significant achievement to be recognized for the Sukuk (Alternate option for Securitization) which we developed as a signature financial instrument that can be offered as an alternate format for the conventional securitization product. 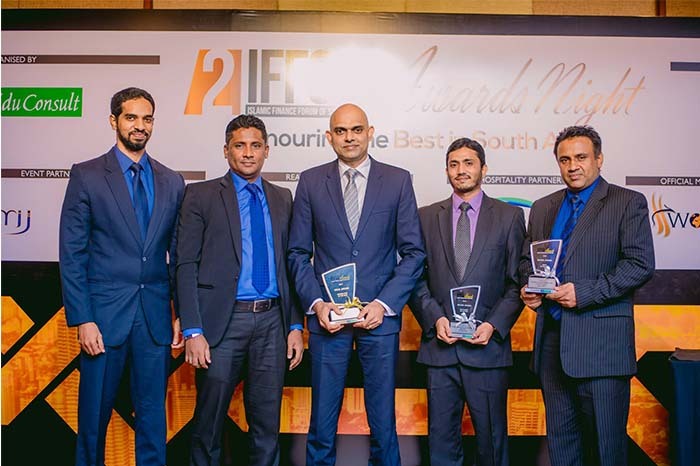 This innovative product which has achieved both local and global recognition by winning the Deal of the Year accolades both at SLIBFI Awards, Colombo and IFN Awards, Dubai has now set a trend in the industry for raising working-capital within the IBF sector. Receiving such recognition clearly signifies our dedication and passion for innovation, industry value addition, raising local standards and international benchmarking within our core business model". Al-Falaah which was established in 2007, functions directly under the auspices of LOLC Finance PLC, which is one of Sri Lanka&apos;s largest non-banking financial institutions. LOLC Finance which is a regulated Finance Company of the Central Bank is rated [SL] A with stable outlook by ICRA Lanka Limited, a wholly owned subsidiary of ICRA Ltd - an associate of Moody&apos;s Investors Service. Mr. Krishan Thilakaratne, LOLC Group Head of Islamic Finance and Director/CEO of LOLC Finance, Mr. Ashan Nissanka receiving the Gold Award for the Islamic Finance Entity of the Year 2017 from Minister of Public Enterprise Development, Mr. Kabir Hashim. LOLC Securities Limited (LOSEC), the stockbroking company of the diversified conglomerate - the LOLC Group, recently conducted a workshop on Capital Market and Mobile App Awareness. The workshop was organised in collaboration with the Securities & Exchange Commission of Sri Lanka (SEC) and the Colombo Stock Exchange (CSE) with the objective of creating awareness on Capital Market and Online Trading through the new Mobile App. 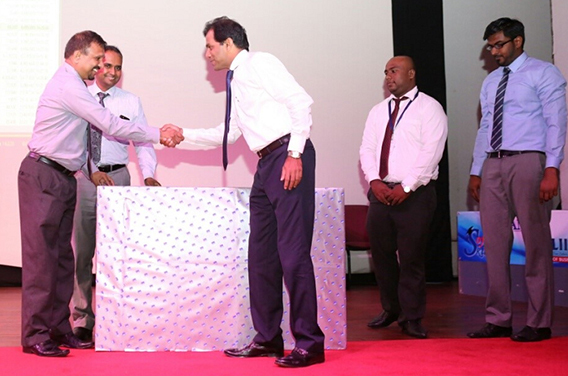 The programme was held recently at the Sri Lanka Institute of Information Technology (SLIIT) in Malabe. About 300 undergraduates took part in the Capital Market and Mobile App Awareness Workshop which was held with the participation of senior officials and representatives from LOLC Securities, the SEC and the CSE. The Workshop covered a range of key topics including the benefits of investing in Capital Market instruments, how to make use of Online Trading facilities in the Capital Market as well as the regulatory aspects relevant to the Capital Market of Sri Lanka. Commenting about the Workshop, Mr. Sriyan Gurusinghe, Managing Director / Chief Executive Officer of LOLC Securities Limited said, "This joint workshop is a timely initiative. In an age when technology is developing rapidly with constant innovation, we need to create awareness that investors can now manage their investments with great ease, anytime and from anywhere. This Mobile Trading App offers live streaming prices, charts, latest news on stock trading and much more". During the workshop, LOLC Securities donated a real time Market Viewer Monitor Screen to SLIIT in order to facilitate and display live market streaming at the SLIIT University premises. The main objective of this donation is to provide real time updates on the Capital Market as well as expand and broad base exposure for the Capital Market among all stakeholders in order to build a sustainable relationship between both institutions. This workshop, the first of its kind in Sri Lanka was conducted by a stockbroking firm in collaboration with a Private University with representation from all stakeholders in the Capital Market of Sri Lanka. Established in 2011, and now a fully owned subsidiary of the LOLC Group, LOLC Securities has been built for excellence in all its dimensions, keeping in mind the assurance sought by discerning investors. LOSEC&apos;s investment advice is backed strongly by an in-house advanced, award winning research team of highly qualified analysts. The market reports compiled by LOLC Securities are detailed and analytical and offer valuable insights into market and economic trends and statistics. Mr. Sriyan Gurusinghe, Managing Director / Chief Executive Officer of LOLC Securities presenting the real time Market Viewer Monitor Screen to Professor Chandana Perera - Dean, Business faculty and Head of SLIIT Research Centre. Resource personnel of the workshop from L-R: Dr. Malitha Wijesundare - Dean, Education and Student Experience SLIIT, Professor Chandana Perera - Dean, Business faculty and Head of SLIIT Research Centre, Mr. Sriyan Gurusinghe - MD and CEO of LOLC Securities Limited, Mr. Niraj Jayamanne - Investment Advisor, LOLC Securities Limited and Mr. Damith Chaminda - Investment Advisor, LOLC Securities Limited. Global Recognition for LOLC Al-Falaah; Wins Deal of the Year. 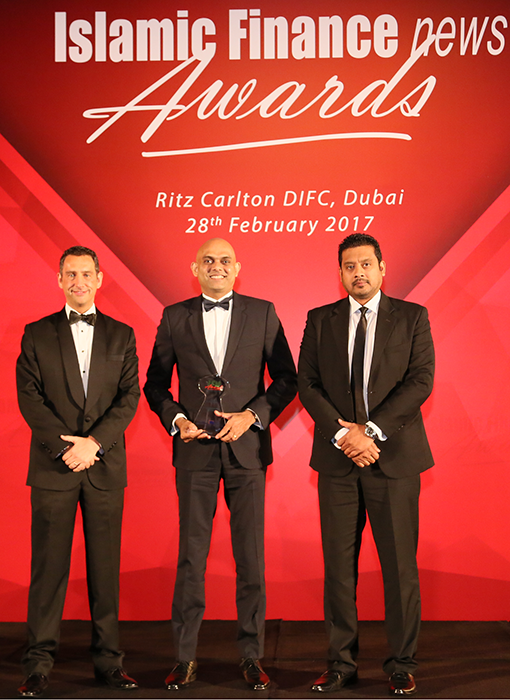 Al-Falaah secured the "IFN Deal of the Year for Sukuk (Alternate option for Securitization)" at the "IFN Deals of the Year for 2016" awards ceremony held on the 28th of February 2017 at the Ritz Carlton, DIFC Dubai U.A.E. This was the first year that Al-Falaah was eligible to compete for the subject category, as it developed a signature financial instrument that can be offered as an alternate format for the conventional securitization product. Further, LOLC Al-Falaah, was also recognized at the Islamic Finance News, Global Poll, IFN-Best Banks Awards 2016 for the fourth consecutive year. With over 26,000 overall votes for all categories, the global Islamic finance fraternity has voted Al-Falaah, Islamic Business Unit of LOLC Finance PLC to be amongst the top of global industry giants. The recognitions received of the two nominated categories are "Best Islamic Leasing Provider, Runner Up" where LOLC Al-Falaah has moved up from 3rd Place in 2015 and maintained the position of "Best Islamic Bank Sri Lanka, Runner Up" for 2016 as well. Commenting on these prestigious wins, Mr. Krishan Thilakaratne, LOLC Group Head of Islamic Finance said, "We are excited to accept these accolades which adds to our list of global recognitions in the Islamic Finance space locally as well as internationally. This is a true demonstration of our robust and innovative approach as an industry trendsetter, focussed on developing financial tools that cater to the growing needs of the industry". Also sharing his thoughts, Mr. Shiraz Refai, Deputy General Manager, Al-Falaah Islamic Business Unit of LOLC Finance said, "Securing the IFN Deal of the Year 2016 is both a first for us as well as the Islamic Finance industry in Sri Lanka. Being recognized under the IFN Global Best Banks Polls is always phenomenal to Team Al-Falaah. It is a significant milestone and accomplishment for the financial year 2016/17 and we are elated that LOLC Al-Falaah&apos;s deliberations to the industry is accepted by our stakeholders and also clearly signifies our continued commitment for innovation, compliance and customized financial solutions on offer". Adding to its bucket list of Global recognitions, LOLC Al-Falaah also secured two prestigious awards at the Global Banking & Finance Review (GBFR) Awards 2016 - United Kingdom, by being crowned the "Best Islamic SME Leasing and Finance Company" and the "Most Innovative Islamic Investment Product (Wakala)&apos;in Sri Lanka for 2016. This is Al-Falaah&apos;s first win at the GBFR which is created to recognize companies of all sizes that are prominent in particular areas of expertise and procure excellence within the global financial community. LOLC Al-Falaah, which is in its 10th year in operation, functions directly under the auspices of LOLC Finance PLC, which is one of Sri Lanka&apos;s largest non-banking financial institutions (NBFIs). LOLC Finance which is a regulated Finance Company of the Central Bank of Sri Lanka (CBSL) is rated [SL] A with stable outlook by ICRA Lanka Limited, a wholly owned subsidiary of ICRA Ltd. (an associate of Moody&apos;s Investors Service). Colombo, Sri Lanka, 17th March, 2017 - LOLC International Private Limited (a wholly-owned subsidiary of Lanka ORIX Leasing Company Plc ("LOLC")) and The Bank of East Asia, Limited ("BEA") announced today that they have acquired a majority interest in PRASAC Microfinance Institution Limited ("PRASAC") from Belgian Investment Company for Developing Countries SA ("BIO"), Dragon Capital Group Limited ("Dragon Capital") and Nederlandse Financierings-Maatschappij voor Ontwikkelingslanden N.V. ("FMO"). Under the new ownership structure, the LOLC Group&apos;s stake in PRASAC increased to 70%, while BEA holds 21% and 9% is held by P S Co., Ltd.
As a Cambodia-incorporated financial institution, PRASAC has evolved significantly since its inception in 1995 as a credit provider involved in financing to rehabilitate the agricultural sector in rural Cambodia. During the last 10 years, PRASAC has grown its asset from US$37 million to US$1.3 billion, and is now the largest micro finance company in Cambodia. PRASAC&apos;s operations have a far-reaching impact at a national level, providing mainly individual loans through 181 branches in all 25 provinces in Cambodia with more than 6,400 employees and an outreach of 350,000 customers in mostly rural communities. PRASAC also has approximately 530,000 depositors with a deposit base of over US$660 million as of February 2017. PRASAC has plans to diversify its business and transform into a licensed commercial bank in the near future. Sim Senacheert, CEO of PRASAC, said: "We would like to express our gratitude towards BIO, Dragon Capital and FMO for their strong support over the past 10 years and look forward to a renewed partnership with our existing shareholder LOLC and strategic investor BEA to further contribute to sustainable economic development and financial inclusion in Cambodia." Ishara Nanayakkara, Deputy Chairman of the LOLC Group, stated: "We saw great potential in PRASAC from the outset, and it was therefore LOLC Group&apos;s maiden overseas investment. We would like to convey our appreciation to the outgoing shareholders for their contribution and look forward to working closely with BEA and the PRASAC management in fulfilling the shared goal of elevating and empowering micro entrepreneurs to create a sustainable, inclusive economy in Cambodia." "We at BEA are pleased to establish a foothold in Cambodia, a core member of the ASEAN Economic Community, with LOLC and PRASAC Management," said Dr. David K.P. Li, Chairman & Chief Executive of BEA. 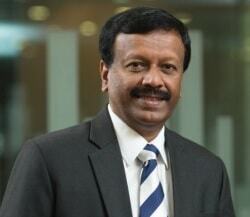 "Through PRASAC, our Bank will further strengthen its presence in Southeast Asia. This strategic investment will enable us to better capitalise on the opportunities arising from China&apos;s &apos;Belt and Road Initiatives&apos;." The LOLC Group is one of the leading conglomerates in Sri Lanka with a diversified portfolio in multiple industries. LOLC Group&apos;s unprecedented growth accounts to its core business - financial services, which have a special focus on Micro and SME sectors. 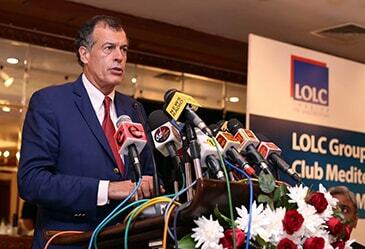 LOLC also has a strong microfinance presence in Cambodia, Myanmar and Pakistan. For more information, please visit LOLC&apos;s homepage at lolc.com. Incorporated in 1918, BEA is Hong Kong&apos;s largest independent local bank, with total consolidated assets of HK$765.7 billion (US$98.7 billion) as of 31st December, 2016. Listed on The Stock Exchange of Hong Kong, BEA is a constituent stock of the Hang Seng. BEA offers customers a comprehensive range of corporate banking, personal banking, wealth management, and investment services through an extensive network of more than 220 outlets covering Hong Kong and the rest of Greater China, Southeast Asia, the United Kingdom, and the United States. For more information, please visit any BEA branch or its homepage at www.hkbea.com. LOLC won the hearts of the people when it was crowned the "Financial Services Provider of the Year 2017" at the SLIM-Nielsen People&apos;s Awards 2017. 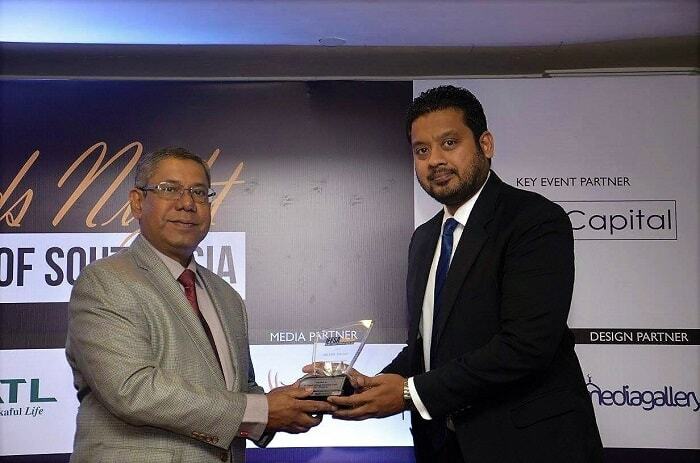 LOLC Group Managing Director/CEO, Mr. Kapila Jayawardena received the coveted award during a glittering awards ceremony held at the Water&apos;s Edge, Battaramulla, recently. Organised for the 11th year, the SLIM-Nielsen People&apos;s Awards is a joint initiative of the Sri Lanka Institute of Marketing (SLIM), the national body for marketing, and Nielsen Sri Lanka, the local arm of the largest information and research company in the world. Known as one of the much awaited events in the corporate calendar, SLIM-Nielsen People&apos;s Awards rewards and recognises brands that have made a powerful impression in the minds of the people. Winners are based on consumer responses or people&apos;s choice rather than on a decision of a panel of judges. Speaking about the achievement, LOLC Group Managing Director/CEO, Mr. Kapila Jayawardena said, "This award is a true reflection on how well the LOLC brand is embedded in the minds of the public and how well the brand has given back to society in terms of benefits, value and more importantly uplifting the socio economic status of the community. Unlike any other awards presentation, at the SLIM-Nielsen People&apos;s Awards, it is the people who decide, who walks home a winner. The people have judged us and they have shown how close we are to their hearts and minds. Being adjudged the Financial Services Provider of the Year, reflects our connection, our strong bond with the people of Sri Lanka, and we consider this as the ultimate recognition." 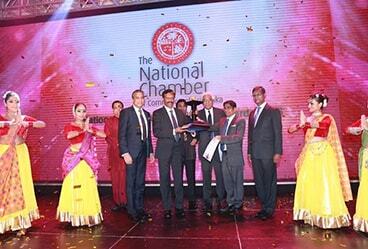 Seen in the picture is Mr. Kapila Jayawardena, Group Managing Director/CEO of the LOLC Group (right) accepting the prestigious award from Mr. Kumar Samarasinghe, Director - Marketing, Singer (Sri Lanka), the main sponsor of the event. Also seen in the picture is Mr. Susaan Bandara, Chief Officer, Marketing Communications, LOLC Group. Renowned for delivering real-world financial solutions, LOLC Finance PLC, Sri Lanka&apos;s Non-Banking Financial Institution (NBFI) giant, has unveiled a comprehensive payment platform named, LOLC Real Time. This mobile and internet banking solution enables LOLC Finance customers to send and receive money, instantly via CEFT (Common Electronic Fund Transfer Switch) and SLIPS (Sri Lanka Interbank Payment System). LOLC Real Time which is a fully integrated, online payment platform, offers unparalleled convenience to customers who seek a superior level of speed, ease and security within the financial ecosystem. With LOLC Real Time, customers can now transfer funds directly and instantly from their LOLC Finance savings account to any bank account of the recipient, using any device. This service is aptly supported by a 24-hour call centre which is equipped to handle customer enquiries on LOLC Real Time as well as ATM registration and other enquiries. Customers can register at any LOLC Finance branch to access the services of LOLC Real Time. Through LOLC Real Time, customers can make their utility bill payments and schedule payments that can be effected at a future date. It also facilitates LOLC Leasing and Insurance payments. In addition, customers can enjoy attractive interest rates on LOLC Savings accounts, with a zero cost on any transaction of any value. LOLC Real Time enables customers to manage multiple LOLC accounts, anytime from any location with just a click of a button. It allows customers to be in control of their day to day financial management in real-time, experience paperless transactions and save time. Since the establishment of LOLC Finance in 2003, the company has been in the vanguard of introducing ground-breaking financial services and products to the domestic financial services sector. LOLC Finance was one of the first NBFI&apos;s that received the mandate to introduce Foreign Currency Savings accounts and the first NBFI to register for SWIFT transactions. The company also pioneered the transferable Fixed Deposit Bond. In the internet and mobile banking landscape, LOLC Finance became one of the first NBFIs to connect with the CEFTS. Adding to this, the LOLC Real Time mobile app is one of the most advanced and secure Real Time payment gateways launched thus far in the NBFI industry of Sri Lanka. Elaborating on LOLC Real Time, Director/CEO of LOLC Finance, Mr. Ashan Nissanka said, "Connecting people and businesses with user-friendly solutions has been one of our key priorities. With continuous technological innovation and improvement, we are geared to provide secure, next generation connectivity to our consumers, 24 hours of the day, 7 days of the week. Through the LOLC Real Time payment platform, all fund transfers will occur in real-time, at zero cost." Explaining about the technological aspect of LOLC Real Time, Mr. Conrad Dias, LOLC Group&apos;s Chief Information Officer said, "We are delighted to introduce our customers a service beyond traditional banking that enables them to transact, any day anytime via LOLC Real Time. This is just the beginning of the digital journey for our customers that brings convenience to their fingertips with positive customer experience in mind. LOLC Real Time is designed on a scalable architecture that complies with the highest levels of information security." LOLC Finance is the flagship finance company of the LOLC Group, that offers carefully tailored financial solutions to a diverse customer base ranging from grass root level entrepreneurs to multinational organisations.  Its portfolio of products and services include the maintenance of Savings and Term Deposit Accounts in Sri Lankan Rupees and Foreign Currency, Inward Worker Remittance, Money Changing, Issue of Visa Debit Card, Islamic Financing, Auto and SME Finance, Working Capital and Foreign Currency business. LOLC Finance is rated (SL) A (Stable) by ICRA Lanka Limited and is licensed by the Monetary Board of the Central Bank of Sri Lanka. Strengthening its product portfolio, the dynamic Insurance arm of the LOLC Group, LOLC Insurance launched two new products under its two entities, LOLC General Insurance Limited and LOLC Life Assurance Limited. The two new products namely, LOLC Suraki Piyasa, unveiled under LOLC General Insurance and LOLC Reality launched under the LOLC Life Assurance banner are simple and affordable insurance policies, designed to cater to the needs of a diverse customer base. 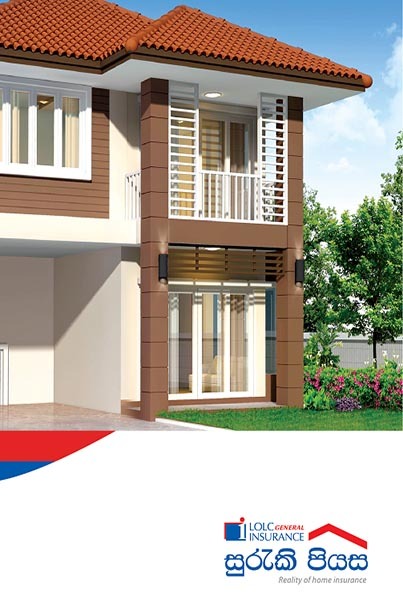 LOLC General Insurance has designed a special home insurance policy named LOLC Suraki Piyasa providing customers the chance to obtain a policy for a selected value instead of insuring for the full value of the property. As a result, customers need not pay the premium based on the total value of the asset. Instead, they could select the insurance cover they need based on values ranging from Rs. 1,000,000 to Rs. 3,000,000 and pay their premiums accordingly. Though the insured value selected by the customer does not represent the actual value of the property, no deductions will be made at the time of claim. Through LOLC Suraki Piyasa, LOLC General Insurance hopes to encourage customers to insure their homes at affordable premium rates. LOLC Reality is a distinctive insurance solution launched by LOLC Life Assurance. Through this policy, customers can obtain the highest cover for a minimum premium with flexible term options between 5 and 30 years. 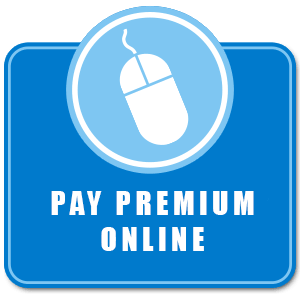 With convenient premium payment options, ranging from monthly, quarterly, half-yearly, annually to single premium, the LOLC Reality policy allows the customer to enjoy a range of additional covers. Both LOLC General Insurance and LOLC Life Assurance follow a customer focussed strategy, backed by the strength and stability of the mother company - the LOLC Group. Both entities have leveraged on the strengths of the Group, particularly its branch network and the broad spectrum of sectors the company is engaged in. With the expertise and support of the LOLC Group, LOLC Life and LOLC General continue to forge ahead with a vision to become the most innovative, customer focussed insurance companies of Sri Lanka. 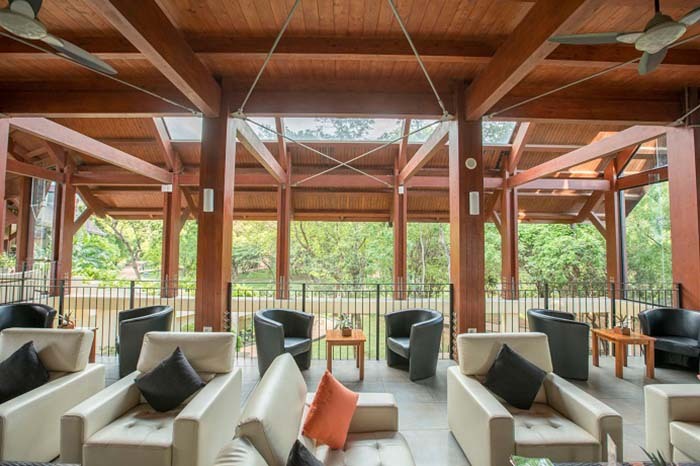 The Paradise Resort & Spa, the luxury resort situated in the heart of the Cultural Triangle in Dambulla has been recognised for its exceptional service by Booking.com, a global leader in booking accommodations, online. The hotel received an outstanding score for consistently receiving glowing reviews, based on months of remarkable guest experiences. Hospitality properties throughout the world are bestowed with the Guest Review Award on an annual basis in recognition of their outstanding achievements in guest service and making Guests feel at home whilst creating a lasting impression. Award winners are evaluated by guest reviews on Booking.com with an overall score of 8.0 and above. 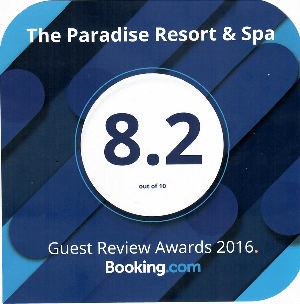 The Paradise Resort & Spa received a notable 8.2 index score in 2016. Mr. Eksath Wijeratne, Group General Manager, Browns Hotels & Resorts, expressing his thoughts on the Booking.com Guest Review Award said, "We are sincerely delighted and grateful to be awarded and recognised as a provider of world class service, offering distinctive experiences to Guests from all over the world. This is a reflection of our consistent service and the efforts and expertise of our dedicated, well trained staff. Further, we would not have been able to win this prestigious award without the positive feedback of our Guests. 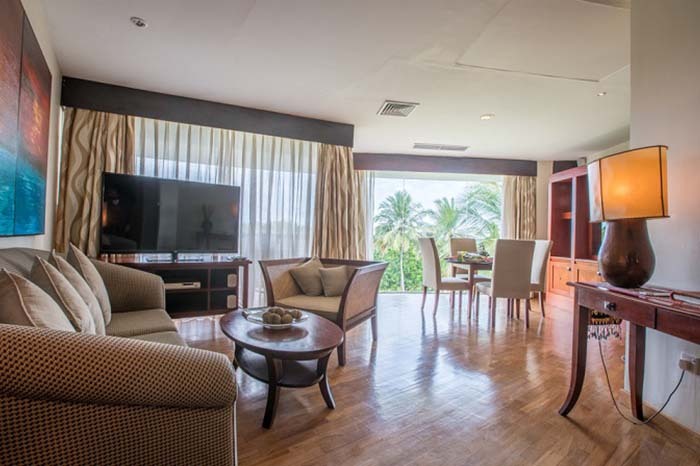 At Paradise Resort & Spa, we will continue to provide the best services to our Visitors, in our own unique way". Set amidst lush greenery, The Paradise Resort & Spa boasts 67 luxurious eco villas ranging from Deluxe Rooms, Superior Duplex Rooms and Garden Suites, tastefully designed with modern amenities and comforts to satisfy the discerning traveller. It is renowned as one of the most prominent holiday destinations in the Central Province of Sri Lanka. Browns Hotels and Resorts (BH&R), owned by Browns Investments, a subsidiary of the Browns Group owns and manages The Paradise Resort & Spa as well as several other key properties in Sri Lanka including The Eden Resort & Spa and Dickwella Resort & Spa, both located along the Southern Coast, and The Calm Resort & Spa, located on the unspoilt, sandy beaches in the East Coast. 3 February 2017, Colombo: The LOLC Group inked a historic joint venture with Pak Oman Microfinance Bank Limited to introduce LOLC&apos;s exceptional and globally accepted Microfinance model to the people of Pakistan. Having observed LOLC&apos;s uniquely effective microfinance business model and its success stories in Sri Lanka, Myanmar and Cambodia, Pak Oman Microfinance Bank Limited which is a joint venture between the Islamic Republic of Pakistan and the Sultanate of Oman, invited LOLC to take a majority stake in their Microfinance venture. Pak Oman Microfinance Bank has been offering a range of micro credit and micro savings products and services to the people of Pakistan, since its inception in May 2006. Through its new partnership with LOLC, Pak Oman Microfinance Bank hopes to capitalise on the speciality of LOLC&apos;s distinctive Microfinance model which keeps transforming and enabling Micro businesses to become Small and Medium level enterprises through sustainable industrialization. In Sri Lanka, LOLC&apos;s microfinance model has made remarkable progress within a short span of time and is successfully steered by four LOLC Group companies, namely, LOLC Micro Credit Limited, LOLC Finance PLC, BRAC Lanka Finance PLC and Commercial Leasing and Finance PLC. These entities promote sustainable development by uplifting the livelihoods of the grassroot level entrepreneurs who are the backbone of the Sri Lankan economy. By empowering the rising entrepreneurs to overcome income disparities, LOLC has successfully empowered communities and revived many different sectors and villages over the years. LOLC&apos;s maiden international investment, PRASAC Microfinance Institution, is currently Cambodia&apos;s largest Microfinance institution, providing access to financial services to rural communities. PRASAC is driven by its ultimate goal to raise the economic standards of the Cambodian people by ensuring financial returns, supplemented by social and environmental protection. In just over 2 years in operation, LOLC Myanmar Microfinance Company Limited (LMML) became the 8th largest microfinance provider in Myanmar, among 168 licensed microfinance institutions operating in the country. LMML consolidated its position in the highly competitive Myanmar market through its unique and innovative microfinancing approach. 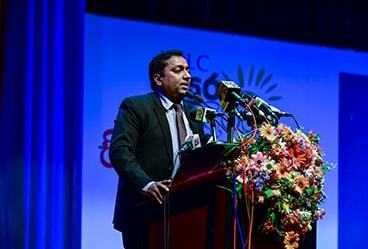 Mr. Kapila Jayawardena, Group Managing Director and CEO of the LOLC Group in a statement at the ceremony said that helping thousands of entities and opening up billions of business opportunities to the smallest businesses have shown a boost in growth of an economy. By helping &apos;startup and small businesses&apos;, we assist them to gain greater confidence through a simplified and unique financial model to progress in any industry of choice. He went on to state that we are glad that the State Government of Pakistan and the Sultanate of Oman, currently holding 100% of Pak Oman Microfinance Bank Limited, have invited LOLC to join hands with them and take on a major stake of the venture, to bring about a distinctive operationally excellent model, to make a game changing difference, thereby uplifting the financial and social performances in the region. He also said that this transaction will continue to spread LOLC&apos;s global footprint and is a compelling opportunity to continue to invest and pursue short and long term growths with operational flexibility. We look forward to working with these two sophisticated investors and roll-out this unique Micro Finance model in the region. Blessed with abundant natural and historical riches, Pakistan is the sixth-most populous country in the world with a population exceeding 200 million people. Agriculture accounts for more than one-fourth of output and two-fifths of employment, while textiles and apparel account for most of the country&apos;s export earnings. LOLC which began as a non-bank financial institution has rapidly yet sustainably evolved to become one of the largest and most diversified conglomerates in Sri Lanka. Today, the portfolio of the LOLC Group encompasses a wide spectrum, from financial services to leisure, plantations and renewable energy and other strategic investments. This transaction with Pak Oman Microfinance Bank perfectly complements the Company&apos;s growth trajectory, expanding the positive impact on the lives of thousands of people in Sri Lanka and beyond. For the second consecutive year, the Eden Resort & Spa was crowned the best in the Hospitality & Tourism Sector of Sri Lanka. The hotel received this recognition at the National Business Excellence Awards (NBEA) 2016 when it won Gold in the Hospitality & Tourism Sector category. The luxurious, Eden Resort & Spa competed with its industry peers to emerge the best in the sector. The award for business excellence in the Hospitality sector at the NBEA is one of the most closely contested and coveted awards. 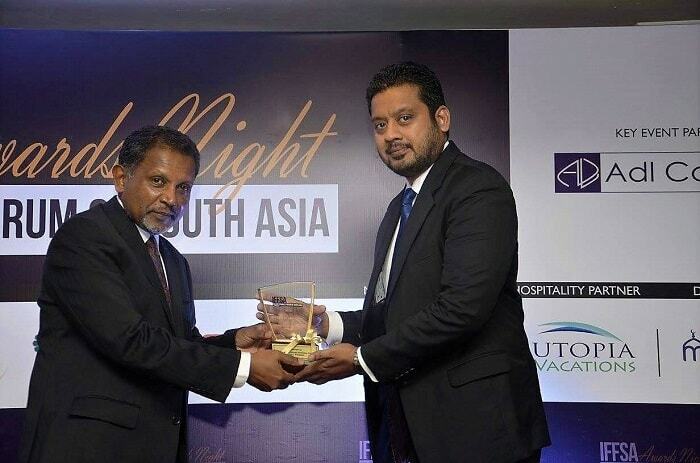 Speaking about the achievement, Mr. Eksath Wijeratne, Group General Manager - Browns Hotels & Resorts said, "We are honored to have received this recognition for the second consecutive year. It is a sign of our continued efforts to maintain the highest standards. At Eden, we pride ourselves on offering exceptional customer service. We are humbly proud of this victory and I would especially like to thank the staff for playing a pivotal role in this significant achievement". 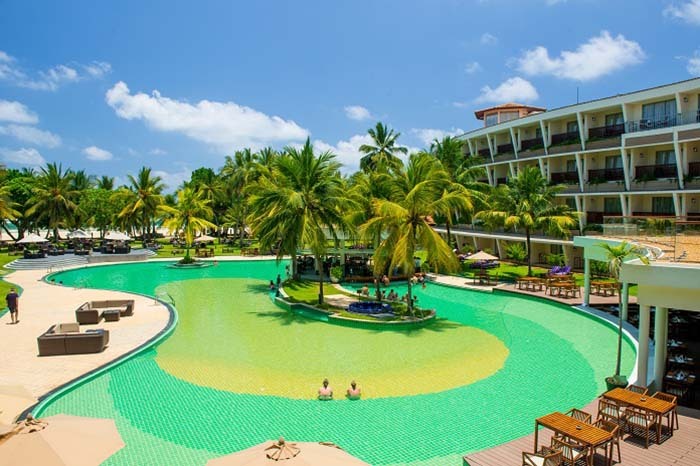 The Eden Resort & Spa is located on the iconic &apos;Golden Mile&apos;, a pristine stretch of beach in Beruwela. Since its refurbishment in 2014, the property has seen a rapid increase in occupancy levels. Over the recent years, the hotel has been recognised locally as well as globally for its outstanding service standards. The 2015 booking.com award, the Trip Advisor Certificate of Excellence 2015, Holiday Check 2016, as well as the Gold Excellence, Gold, Silver and Bronze awards won at the Chef&apos;s Guild, are some of the recent awards and honours received by the hotel. 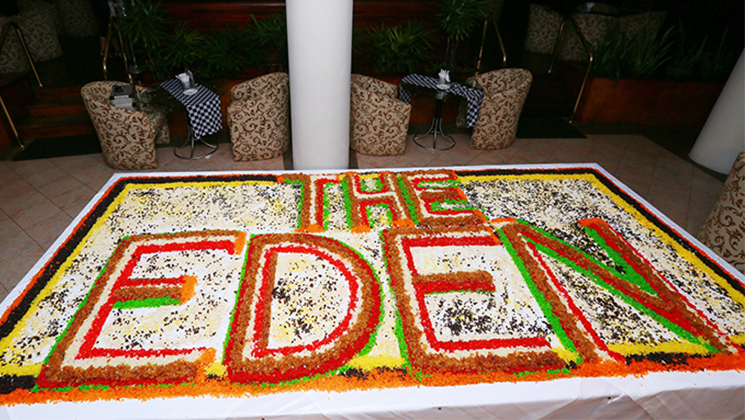 Eden operates under Browns Hotels and Resorts which boasts a rich history of over 20 years in the hospitality industry of Sri Lanka. Offering 158 elegantly furnished luxury rooms, suites and penthouses, and an exclusive spa, the hotel was awarded with the prestigious ISO 22000:2005 certification in relation to food safety and food quality standards. Backed by these phenomenal credentials, the Eden Resort & Spa continues with its commitment to providing world class hospitality by exceeding the expectations of its guests, and continually upgrading its range of offerings. From L-R, Mr. Eksath Wijeratne, Group General Manager, Browns Hotels & Resorts, Mr. K. B. S. Bandara, Deputy General Manager, Sales & Channel Management, Bank of Ceylon, Mr. Nandika Buddhipala, Chairman, Technical Evaluation Panel NBEA 2016 - presenting the Award. The LOLC Group, one of the largest and most diversified conglomerates in Sri Lanka has embarked on several Renewable Energy initiatives within the organization as well as on a national scale, with a mission to commit towards a sustainable future, by meeting the needs of the present without compromising the needs of the future generations to meet their own. Playing a significant role in the foremost economic sectors of the country, the rapidly evolving LOLC Group employs over 5000 staff members in various regions across the island. With a firm belief that promoting renewable energy starts from within, LOLC initiated several programmes to increase the awareness and promote the adoption of sustainability amongst the Group staff, recently. In line with this, a Group wide competition titled &apos;Rewarding you for Sustainability&apos; was implemented with the objective of promoting active involvement of the staff. Ten lucky winners were picked and rewarded through a competition which was conducted across the Group representing all districts. At the awards presentation which took place at the LOLC Head Office, the winners were also appointed as Ambassadors to carry the message of Sustainability to the various regions and divisions. The LOLC Group stepped into the year 2017 with a bold initiative to contribute to the forest cover of Sri Lanka. Today, deforestation is considered one of the most serious environmental issues in the country and the concerns keep growing. In this backdrop, the LOLC Group commenced the new year with a tree planting campaign named, "Ratak Surakinna, Gasak Sitawanna - Plant a tree and Preserve the Country". 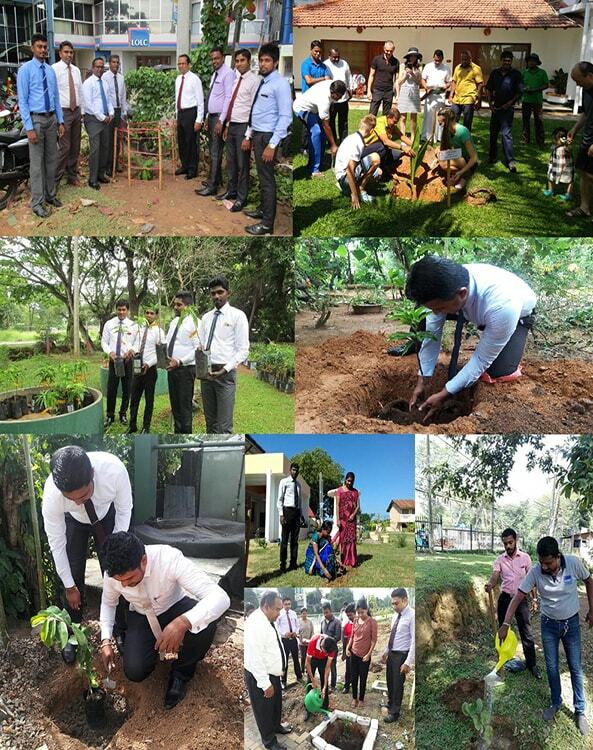 The staff of all LOLC Group companies actively took part in the tree planting programme during the first working week of 2017 by planting a tree in their office premises, home garden or in a nearby public place such as a school or a park. In addition to inculcating the good habit of tree planting, one of the key objectives of this programme is to ensure that the staff members nurture the plant until it grows to a tree. LOLC aims to plant 2,000 trees in 2017 and hopes to continue with its tree planting effort annually to enhance the forest cover, island wide. In doing so, LOLC also hopes to reward and recognize the Group companies and staff members who are committed to this campaign over a period of time. Furthermore, all new employees joining the LOLC Group are educated about the Group&apos;s sustainable energy efforts at the staff induction programmes. The Group also plans to launch some innovative products with a view to promote Renewable Energy amongst its vast customer base. Commenting on LOLC&apos;s ongoing Renewable Energy efforts, Mr. Kapila Jayawardena, LOLC Group Managing Director/CEO said, "We are extremely pleased with the level of enthusiasm and engagement demonstrated by our staff, based right throughout the country. This also demonstrates that through collective action we can confront the common, central challenges and achieve lasting change. As a Group, we have taken an aggressive approach on developing and promoting renewable energy sources and reforestation. Our commitment is to create a sustainable environment whereby making an overall impact on the environment we live and operate in". On a national context, LOLC ventured into solar power generation when its Group company, Sagasolar Power (Private) Limited recently opened Sri Lanka&apos;s first and largest Utility Scale Solar Power plant in Hambantota. The plant which is the first of its kind initiated by the Private sector has the capacity to produce 10 MW of power to the National Grid. With continuous expansion, LOLC also envisages to take its Renewable Energy initiatives worldwide by introducing it to its Cambodian and Myanmar offices. In 2008, LOLC became a signatory to the United Nations Global Compact (UNGC) strategic policy initiative which seeks to promote sustainable and responsible businesses throughout the world. Sustainable initiatives have always been widely practiced in all LOLC&apos;s core businesses since its early inception. The LOLC Group&apos;s sustainability journey is not a mere effort to improve its systems and operations but an effort to positively impact the processes beyond the boundaries of the company. Some images from the many regions and divisions that took part in the "Ratak Surakinna, Gasak Sitawanna - "Plant a tree and Preserve the Country" "programme of LOLC, launched on 1st January 2017. 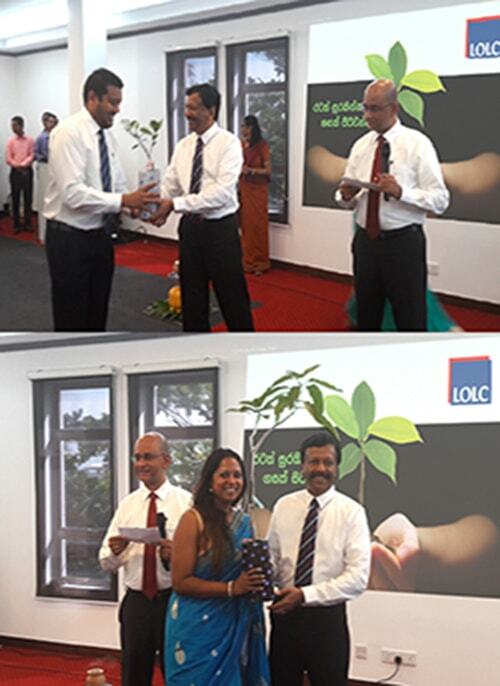 Some of the Group's Senior Members receiving plants from Mr. Kapila Jayawardena, LOLC Group Managing Director/CEO. 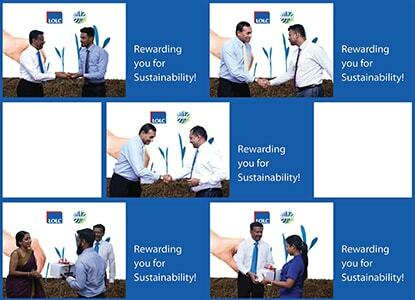 A few winners receiving their awards at the 'Rewarding you for Sustainability' awards ceremony from Mr. Kapila Jayawardena, LOLC Group Managing Director/CEO, Mrs. Kalsha Amarasinghe, Executive Director, LOLC Group and Dr. R. A. Fernando, Director, LOLC Group. LOLC Group company, Sagasolar Power (Private) Limited (Sagasolar) announces the opening of the first ever Utility Scale Solar Power plant in Sri Lanka. The plant based in Baruthankanda, Hambantota has the capacity to produce 10 MW of power that will be supplied to the National Grid. 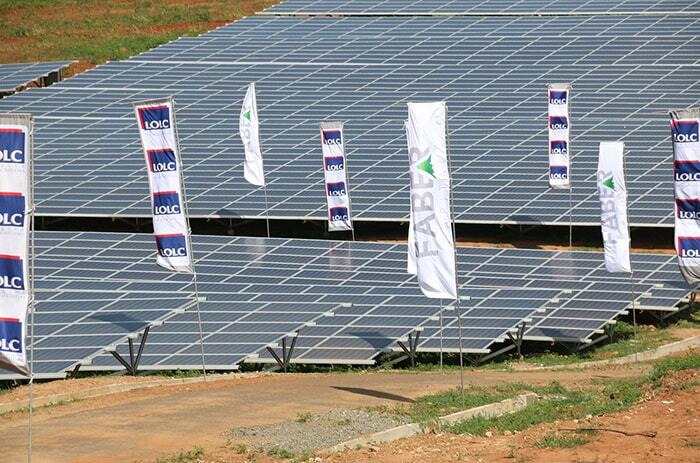 Sagasolar is a subsidiary of the LOLC Group and is a collaboration with Faber Capital Limited. The development of this landmark plant is in line with Sri Lanka&apos;s National Energy policy, which has the key focus of converting fossil fuel used in Electricity Generation to Sustainable Renewable Sources. Sri Lanka&apos;s renewable energy journey began with Hydro power, supplemented by Wind Power, where this landmark project, has now embarked on generation through Solar Power, is arguably the most abundant and sustainable energy resource available in the country. The 10 MW Solar plant, has been built on 45 acres of land within the Energy Development Area declared by Gazette notice 1720/5 on the 23rd of August 2011 under the Sri Lanka Sustainable Energy Authority Act. This project, the first of its kind by the Private sector, is over seven times the size of the largest Solar project in Sri Lanka at present; which is the 1.3MW pilot project owned and operated by the Sustainable Energy Authority, located in Hambantota. Hambantota has one of the highest levels of Annual Global Horizontal Irradiation (GHI) in Sri Lanka. After energizing, the project will supply approximately 20 GWh, which will be sufficient to provide the annual electricity needs of approximately 15,000 typical Sri Lankan homes. The project will also reduce carbon dioxide emissions from power generation in the national electricity system by a margin of 11,000 tonnes per year. The Power Plant was ceremoniously opened on the 21st of December 2016 under the patronage of Hon. 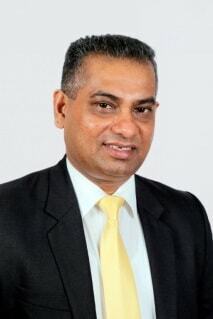 Ranjith Siyambalapitiya, Minister of Power and Renewable Energy and Hon. Ajith P. Perera Deputy Minister of Power and Renewable Energy. The project debt is financed by a banking consortium experienced in renewable energy projects, with DFCC Bank taking the largest exposure followed by Commercial Bank and Hatton National Bank. The project is a collaboration between the LOLC Group and Faber Capital Limited, the key equity providers. "At LOLC, we believe our achievements in sustainability are more than fulfilling a responsibility, or a feather in our cap; it is embedded in our business model, and has made us who we are today. In the recent years, Renewable energy has gained prominence in the Sri Lankan economy, and LOLC Group is poised to play a key role in enhancing our commitment in environmental stewardship. We are highly excited to venture into Solar power generation, first of its kind and magnitude by the private sector, reflecting our true passion for a greener tomorrow", said Mr. Ishara Nanayakkara, Deputy Chairman, LOLC Group. Faber Capital Limited is a boutique investment Bank which specializes in the implementation and financing of renewable energy projects in Asia, Africa and the Middle East. Dilshan Hettiaratchi, Managing Director of Faber Capital said, "We are indeed honoured to be involved in the development of Sri Lanka&apos;s first Utility Scale solar project. Generation of Energy from Solar power is the next frontier in Sri Lanka&apos;s energy generation journey. The country has successfully harnessed sustainable resources for generation of energy needs for over half a Century. The main resources used were Hydro, with Wind supplementing generation capacity over the last decade. With this exciting project, Solar has also been introduced to the generation mix. We at Faber Capital invested in this landmark project over a year ago and combined the implementation and financing elements required to complete the project. We hope this project will be a catalyst to popularize energy generation through Solar Power, which is arguably the most sustainable green resource available in the country." Hon. 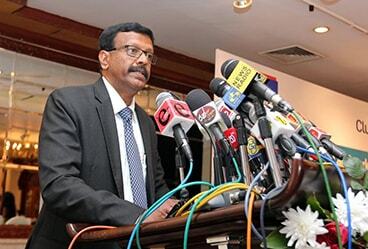 Ranjith Siyambalapitiya, Minister of Power and Renewable Energy and Hon. 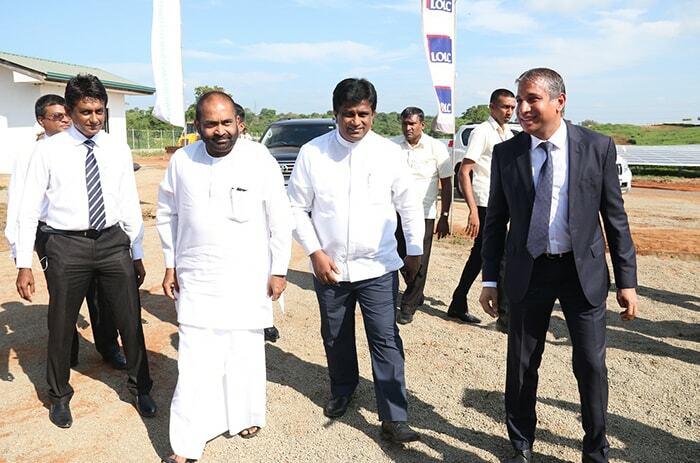 Ajith P. Perera Deputy Minister of Power and Renewable Energy touring the site with Mr. Ishara Nanayakkara, Deputy Chairman, LOLC Group, Dilshan Hettiaratchi, Managing Director of Faber Capital and Eng. J.D.K. Wikramaratne, Chairman of Sri Lanka Sustainable Energy Authority. Hon. Ranjith Siyambalapitiya, Minister of Power and Renewable Energy and Mr. Ishara Nanayakkara, Deputy Chairman, LOLC Group unveils the plaque. Hon. Ranjith Siyambalapitiya, Minister of Power and Renewable Energy and Hon. 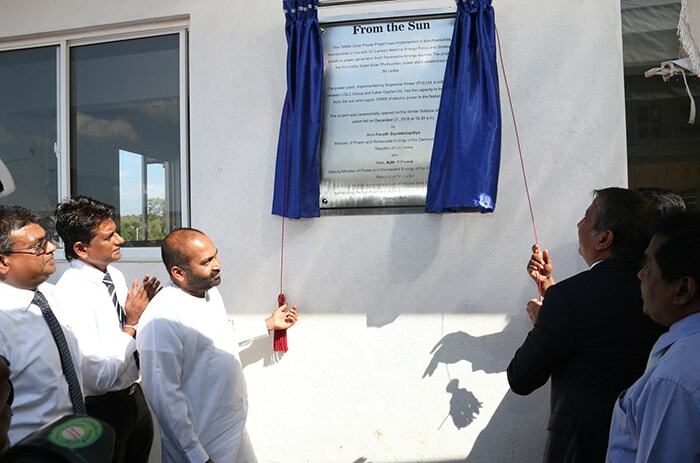 Ajith P. Perera Deputy Minister of Power and Renewable Energy and Mr. Ishara Nanayakkara, Deputy Chairman, LOLC Group ceremonially opening the largest Solar Power plant in Sri Lanka. The head office of LOLC Life Assurance was relocated to their modern premises at No 481, T. B. Jaya Mawatha (Darley Road), Colombo 10 recently. Located in the heart of Colombo, LOLC Life Assurance is now geared to offer greater convenience and access for customers from its spacious, new head office complex. LOLC Group Managing Director/CEO, Mr. Kapila Jayawardena graced the opening as the Chief Guest together with Mrs. Kalsha Amarasinghe, Executive Director amidst a gathering of Directors and Senior Management of LOLC Group, COO of LOLC Insurance, Mr. Nilanga Wickramasinghe, and the company staff and well-wishers. LOLC Life Assurance offers an extensive range of insurance products to help both individuals and businesses prepare for the unexpected with products such as Child Protection Plan, Life Protect Plan, Life Protect Plus Plan, Pensions Plan, and Loan Protection Plans applicable for both individuals from all walks of life and Corporates. LOLC Assurance understands customers&apos; diverse needs hence the reason to have a range of products to suit individual requirements. The LOLC Life Assurance Life Protect is a flexible insurance policy that offers the security of guaranteed protection with the added benefit of periodical returns to the fund account, offering the flexibility of choosing an ideal combination of savings and protection. LOLC Life Assurance also offers Critical Illness Cover on 29 identified illnesses and daily hospitalization benefits along with a Life Cover. Meanwhile, the LOLC Life Assurance Pension Plan is an insurance policy designed to build a retirement fund whilst extending the option of enhancing the policy with protection covers. Further, the LOLC Life Assurance Child Plan is a unique policy designed to provide security for children&apos;s future to take care of future educational and other financial needs. 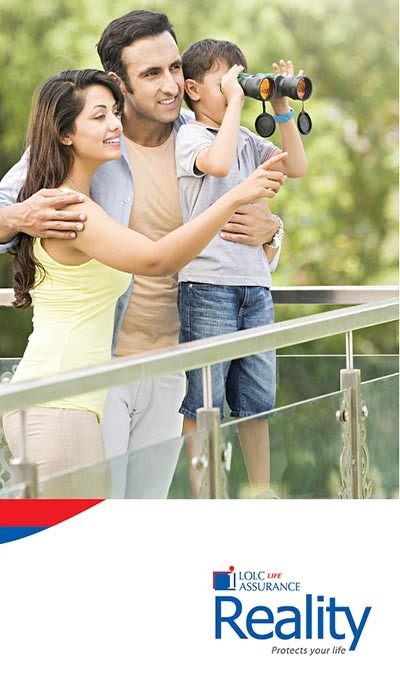 Also, Life/Family Takaful provides the breadwinner of the family both a protection policy and long-term savings. The LOLC Life Assurance Home Loan Protection Policy settles all outstanding loans and releases any mortgaged property upon the Death or Permanent Disability of the borrower. LOLC Life Assurance leverages on LOLC&apos;s strong distribution channel of 173 outlets to expand its market share. Since its inception in 2011, the company has been experiencing rapid and sustainable growth. The company boasts of a professional Life Insurance sales force that is poised to further penetrate the market in the year ahead via all channels. The Life Insurance posted significant growth by recording 73% growth in GWP in the first half of 2016 over the corresponding period in FY2015. LOLC Group reached the pinnacle of Excellence when it was crowned as the overall Gold Award Winner at the National Business Excellence Award (NBEA) 2016 at a glittering awards ceremony held recently in Colombo. Whilst securing the overall Gold Award, LOLC Group also won a number of other sub-sector awards at the NBEA 2016, organised by the National Chamber of Commerce of Sri Lanka (NCCSL) for the 13th consecutive year. NBEA is recognised as Sri Lanka&apos;s highest Corporate Award. In addition to the overall Gold Award, the LOLC Group also won Gold in the Extra Large Category as well as in the Diversified Group of Companies Category. The Group&apos;s flagship luxury hotel, The Eden Resort & Spa won Gold in the Hospitality & Tourism Sector. The Group also won three Bronze Awards for Excellence in Performance Management, Excellence in Business and Financial Results and Excellence in Local Market Reach. The NBEA which is presented annually by the NCCSL recognizes business enterprises which have demonstrated excellence in business, whilst contributing to the socio-economic progress of the nation. This year, many corporate establishments stepped forward to compete in the NBEA with the introduction of the new evaluation model scheme and criteria. According to the new model, Business Enterprises were evaluated under a newly structured evaluation model of 7 perspectives, which included Excellence in Leadership, Excellence in Corporate Governance, Excellence in Capacity Building, Excellence in Performance Management, Excellence in Local and Global Market Reach, Excellence in Corporate Social Responsibility and Environmental Sustainability and Excellence in Business and Financial Results. Sharing his thoughts about the victory, LOLC Group Managing Director/CEO, Mr. Kapila Jayawardena said, "This is a remarkable achievement and it clearly signifies LOLC&apos;s exceptional performance, dynamism and excellence in corporate Sri Lanka. We are very pleased that LOLC has been ranked number 01 and I believe our rank confirms the success of our efforts in ensuring continuous improvement, unwavering professionalism and long standing partnerships". The LOLC Group is a leading diversified conglomerate present in the foremost economic sectors of the country. LOLC has evolved rapidly over the past few years from a leading financial services provider to one of the largest and most diversified conglomerates in the country. Today, LOLC&apos;s portfolio is broadly categorised as financial services and non-financial services, encompassing leisure, plantations, agri-inputs, renewable energy, construction, manufacturing and trading and other strategic investments. Pursuing new markets and taking Sri Lanka to the world, LOLC has ventured into two overseas investments setting up operations in Cambodia and Myanmar with many more plans in the pipeline for regional expansion. The NBEA is one of Sri Lanka&apos;s pioneering Awards Competitions which was launched in 2004 by the NCCSL. Over the years the awards have maintained its high standard and has gained much prestige and popularity among the business community due to the well-structured Awards Scheme that is carefully adjudicated by a competent and eminent panel of judges. LOLC Group Managing Director/CEO, Mr. Kapila Jayawardena and LOLC Group Deputy Chairman, Mr. Ishara Nanayakkara receiving the National Business Excellence Award 2016 from the Chief Guest, Dr. Indrajit Coomaraswamy, Governor - Central Bank of Sri Lanka. 25 November 2016, Colombo: The LOLC Group and Club Mediterranee - France, signed a historic agreement on 25th November 2016 which will witness the Riverina Resort in Beruwela being branded as the First Club Med Resort in Sri Lanka. The landmark agreement was signed between LOLC Group Managing Director/CEO, Mr. Kapila Jayawardena and Mr. Henri Giscard d&apos;Estaing, President and CEO of Club Mediterranee, on behalf of the respective companies. The establishment of the globally-reputed Club Med brand in Sri Lanka opens a new chapter in the country&apos;s higher value tourism prospects. Under the terms of the agreement, Club Med will brand, market and manage the property as one of its many exotic Club Med destinations attracting affluent tourists from Europe and Asia to Sri Lanka. This development will further the industry&apos;s aspirations to develop the island as a magnet for high spending tourists while simultaneously creating a significant number of direct and indirect employment opportunities. 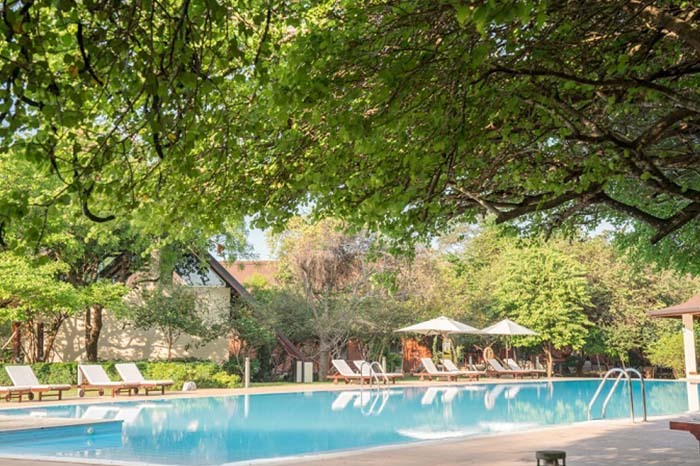 Club Mediterranee SA, commonly known as Club Med, is a French company specialising in operating Club Resorts at a number of exotic destinations around the world. 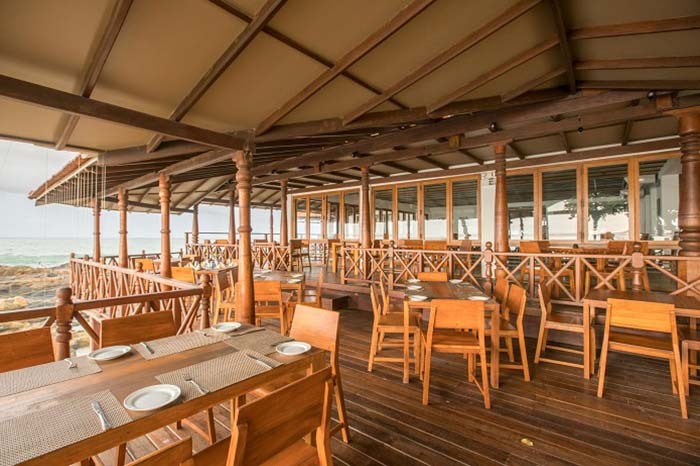 The LOLC Group is a leading diversified conglomerate present in the foremost economic sectors of the country and over the past few months has aggressively expanded its leisure portfolio of properties in neighbouring Maldives. It has made significant investments in the Maldives, by securing some of the most sought after real estate in Male and in strategic locations among other Atolls. The LOLC Group is also diversifying its interests in the leisure sector by having set up a destination management company, an out-bound arm and a popular entertainment complex. Commenting on the new milestone, Mr. Kapila Jayawardena, Group Managing Director of the LOLC Group, said, "We are pleased to have Mr. Henri Giscard D&apos;Estaing, the President and CEO of Club Mediterranee, to sign this historic venture that ushers in one of the most prestigious tourism brands in the world to Sri Lanka. We are confident that this will be a mutually rewarding partnership that will add immense value to Sri Lanka Tourism. As a tourism destination, Sri Lanka has a rich and diverse offering spanning nature, culture, religion, adventure and eco-tourism, and we are confident that it will ascend in popularity and profitability to become one of Club Med&apos;s premier properties. LOLC has forged strategic partnerships across its business sectors and this collaboration with yet another international brand reflects the strong investment potential of the group. 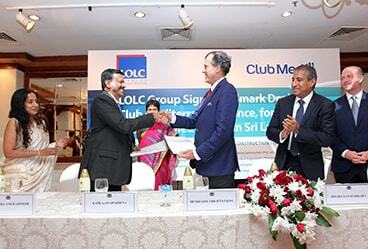 Scheduled for completion in 2018, Sri Lanka&apos;s First Club Med is yet another pioneering initiative by LOLC." President and CEO of Club Mediterranee, Mr. Henri Giscard D&apos;estaing added, "We are delighted to embark on setting up the first Club Med in Sri Lanka, which is an exceptional destination. The beautiful island and the strategic location of the property reflects the exclusivity that Club Med looks for in its new locations. 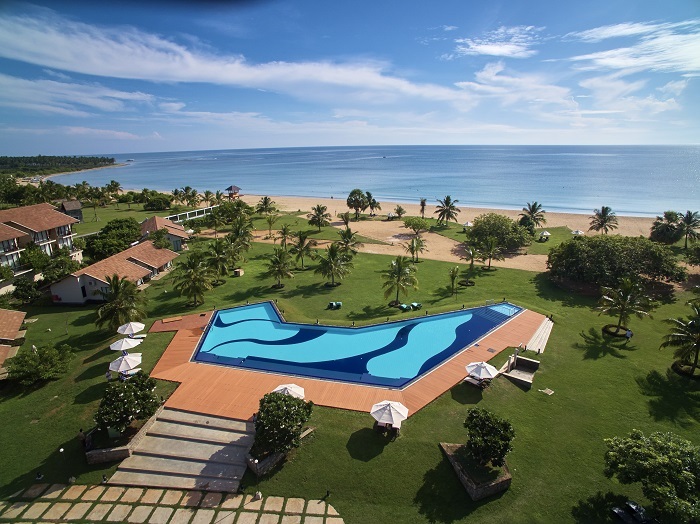 We believe that the Sri Lanka Club Med will be much in demand with our members. We have found in the LOLC Group, a dynamic partner with whom we expect to have a rewarding relationship. Doing business in Sri Lanka thus far has been a pleasure and we expect to forge closer bonds with this gorgeous island country going ahead. I am grateful to the Board of Directors and senior management of the LOLC Group for their warm welcome. I would like to thank the Government of Sri Lanka and the tourism authorities for facilitating the first Club Med in the country." Over the past 65 years, Club Med has been the specialist in helping transform emerging destinations into international high-level tourist places, generating great global interest and immediate traffic wherever it settles. Bali, Cancun, Punta Cana, the Maldives and Phuket are perfect examples of destinations launched into the list of world-class destinations after Club Med&apos;s first resort was established in those locations. LOLC Group was represented by Mr. Ishara Nanayakkara, Deputy Chairman, Directors Mrs. K. Amarasinghe and Mr. Kamantha Amerasekera and Mr. Ajit Jayemanne, Consultant Director of the Leisure Division, whilst Club Med was represented by Mr. Xavier Desaulles and Mr. Marc De Jouffroy. 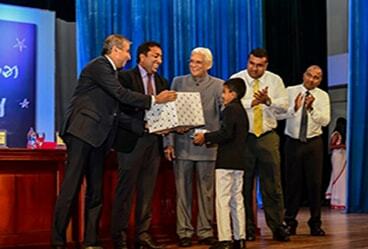 November 25th, 2016 - LOLC Micro Credit Ltd. (LOMC), one of the largest and leading microfinance companies in Sri Lanka and subsidiary of the LOLC Group, successfully concluded its 7th annual &apos;Isuru Diriya Sisu Upahara Scholarship Awards Ceremony&apos; at a gala event held at the BMICH Colombo. The &apos;Isuru Diriya Sisu Upahara Scholarship&apos; is LOMC&apos;s most valued and dedicated CSR project which is held annually to felicitate the children of LOMC customers who achieved top marks at the national Grade 5 scholarship examination conducted by the Department of Education. Covering all districts in the country, a total of 797 students were awarded scholarships with cash prizes and gifts of stationery, books, sports items and school shoes. 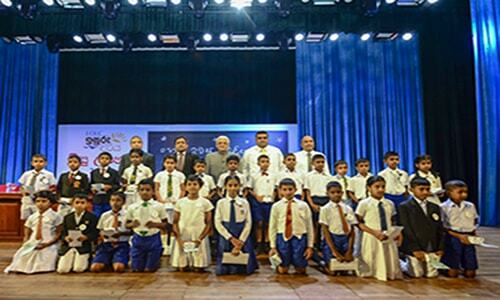 During the official ceremony held at the BMICH, 251 students were awarded with scholarships to support their first steps into secondary school while the gifts and scholarships of the balance 546 students were delivered to their homes. Similar to previous years, the selection criteria for the Sisu Upahara Scholarship programme continues to be well structured and transparent extending the scholarships to deserving students based on both merit and financial need. Hon. 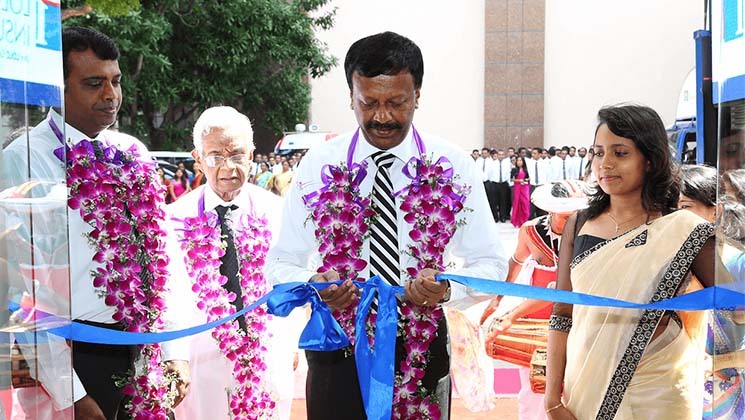 Minister of Education, Akila Viraj Kariyawasam graced the ceremony as the Chief Guest. Professor J. B. Dissanayake who is an eminent writer and consultant on language, grammar and culture, participated as the Guest Speaker. Speaking at the Awards Ceremony, Professor Dissanayake encouraged and motivated the young achievers and shared some valuable insights on how to successfully reach their future educational goals. Also in attendance were, LOLC Group Deputy Chairman, Mr. Ishara Nanayakkara, LOLC Group Managing Director/CEO, Mr. Kapila Jayawardena, Executive Director of LOLC, Mrs. Kalsha Amarasinghe, and Director/Chief Executive Officer LOMC, Mr. Ravi Tissera. Senior management members of LOLC, staff members, parents of students and well-wishers were also present. During this year's ceremony, top three achievers, namely, Sudaraka Heshan Deshabandu from Galgamuwa, Selwakumar Shehan Kanishka from Horana and Kuganeswaran Kulavili from Vavuniya along with other high-achievers were recognised and presented with special gifts. Mr. Ravi Tissera, Director/CEO of LOLC Micro Credit Limited speaking at the award ceremony said, "Since our very first Isuru Diriya programme which was held in the 2010/11 financial year, we have felicitated over 2,500 outstanding scholarship students. By awarding and celebrating their achievements we not only give them the necessary impetus to further their education but create the inspirational platform for them to aspire to achieve greater success in the future. Therefore, this annual event is a unique and special one." 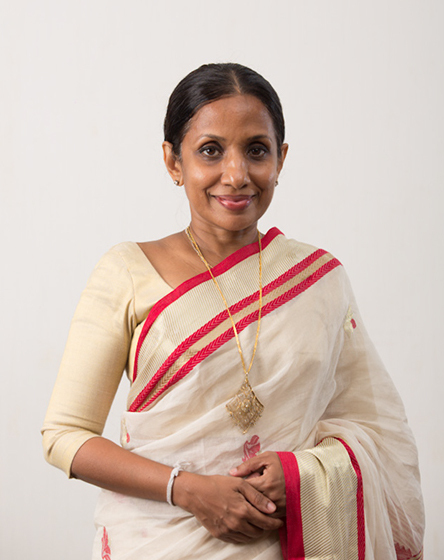 Inaugurated in 2009, LOLC Micro Credit, with the financial strength of renowned overseas Development Finance Institutes and the support of the LOLC Group, rose among Sri Lankan corporates as one of the leading microfinance solutions providers dedicated towards uplifting the low income segment of the country. The Company has also been the first and only Sri Lankan microfinance institute to be awarded with the certification for Client Protection Principle. With a disbursement portfolio of Rs. 47 Billion and a growing borrower base of nearly 400,000, the Company has gained success and recognition both at home and overseas. (US$3.37 million) Sukuk from the domestic market, setting a precedent for corporate Sukuk issuances in South Asia. Sukuk is commonly referred to as &apos;Sharia&apos;h compliant&apos; securitisation which is a fast emerging source of alternative funding often referred to as Islamic securitisation. 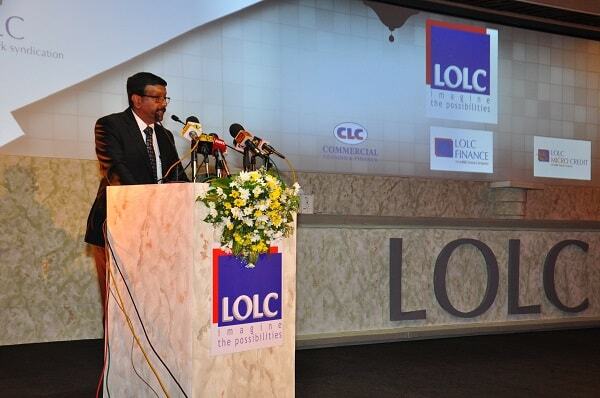 The Sukuk Al Ijarah issuance of LOLC Finance was subscribed entirely by the Bank of Ceylon. The three-year Ijarah facility proceeds will contribute to further develop the Islamic Finance capital market, by not only opening a new window for companies seeking Islamic Finance but also provide a viable investment instrument for any potential Islamic investor. The Trustee to the issuance was HNB Custodial Services while Trillion Securities (Pvt) Limited acted as the financial adviser, arranger and lead manager. The Legal aspect was handled by Nithya Partners. Elaborating on Sri Lanka&apos;s first Sukuk Al Ijarah issuance, Mr. Krishan Thilakaratne, the Group Head of Islamic Finance of LOLC said, "As there has never been a Sukuk issuance in Sri Lanka, we had the challenge of drafting the agreements and arranging the parties. Further, we are building a fairly substantial Ijarah base and we have the capacity to go with a larger issue in the future. Ideally, we would like to get off shore investors but there are hurdles to overcome such as exchange risk options". Mr. Thilakaratne further said,"There is a great appetite for investment in the company but we lacked a proper Sukuk structure or product that we could bring to the capital market. The focus for us now is to fine-tune what we have now for the international market. I would also like to make special mention of the members of Al-Falaah&apos;s Shari&apos;ah Supervisory Board, Ash-Shaikh Fazil Farook, Ash-Shaikh Murshid Mulaffer and Mufti Shafiq Jakhura, who are all well-known, eminent Scholars in the industry for their pivotal role in structuring and drafting the agreements according to the precepts of Islamic Finance". Having successfully raised Islamic capital from the domestic market, LOLC Finance is focusing on capturing foreign funds, in a Sharia&apos;h compliant manner. Backed by Japan&apos;s multinational conglomerate ORIX Corporation, the LOLC Group is renowned for its strong international funding base. Speaking about the landmark deal, Mr. D.M Gunasekera, General Manager of Bank of Ceylon (BOC) said, "The experience and the learning curve of this joint effort is one of the convergence the industry is vying for and therefore others too can join hands with us for win-win deals. BOC being the No. 1 Bank in the country has the responsibility to support the financial industry to introduce various types of products depending on the requirements of the depositors and the borrowers". 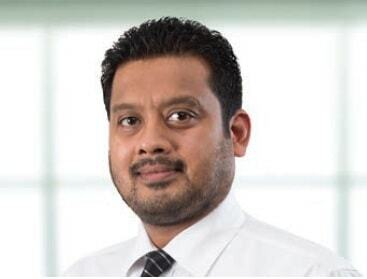 Meanwhile, Sampath Kulatunga, Director / CEO of Trillion Securities (Pvt) Limited (TSL), the arranger and lead manager of the issue said, "The challenge to us was that this issue was the first ever Sukuk Al Ijarah receivable securitisation transaction, structured in the Sri Lankan capital market. The first ever Sukuk Al Ijarah securitisation transaction became a reality due to the effort of all stakeholders who worked tirelessly to ensure the successful launch of this issue". Mr. Jonathan Alles, Managing Director and CEO of HNB commented that the Bank is proud to be appointed as the trustee to the Rs. 500 million Bank of Ceylon funded, Sri Lanka&apos;s first Sukuk Al Ijarah securitisation of LOLC Finance PLC and this mandate is a testament of the level of confidence that the market has placed on HNB as the preferred corporate banking partner. LOLC Finance PLC, which is one of Sri Lanka&apos;s largest non-banking financial institutions is a regulated Finance Company of the Central Bank. LOLC Finance is rated [SL] A with stable outlook by ICRA Lanka Limited, a wholly owned subsidiary of ICRA Ltd, an associate of Moody&apos;s Investors Service. LOLC Finance PLC has successfully issued a Rs. 500 million (US$3.37 million) Sukuk from the domestic market, setting a precedent for corporate Sukuk issuances in South Asia. Sukuk is commonly referred to as &apos;Sharia&apos;h compliant&apos; securitisation which is a fast emerging source of alternative funding often referred to as Islamic securitisation. Mr. Thilakaratne further said, "There is a great appetite for investment in the company but we lacked a proper Sukuk structure or product that we could bring to the capital market. The focus for us now is to fine-tune what we have now for the international market. I would also like to make special mention of the members of Al-Falaah&apos;s Shari&apos;ah Supervisory Board, Ash-Shaikh Fazil Farook, Ash-Shaikh Murshid Mulaffer and Mufti Shafiq Jakhura, who are all well-known, eminent Scholars in the industry for their pivotal role in structuring and drafting the agreements according to the precepts of Islamic Finance". 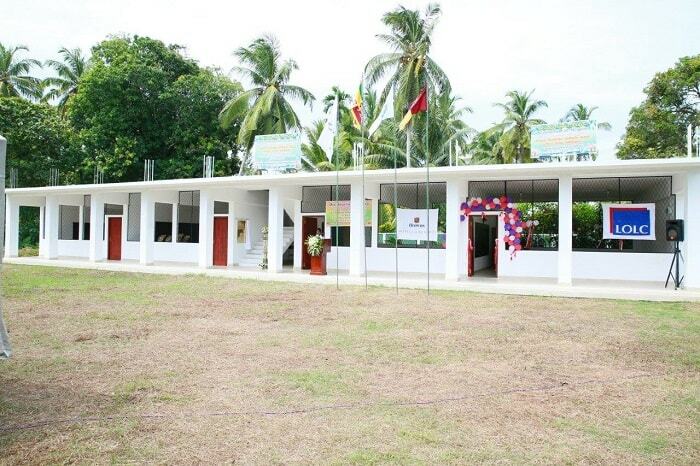 The Eden Resort & Spa reached yet another milestone in its long continued efforts of uplifting the lives and livelihoods of the Beruwala community by inaugurating the first phase of the building project at the Moragalla Junior School in Beruwala. Law & Commercial Arbitration. Initiated by the management and staff of The Eden Resort & Spa, financial assistance for the first phase of the Moragalla Junior School building was provided by Miss Chris McGrail, a frequent visitor to Eden hailing from West Midlands, UK. Affiliated to the Redhill School of England as the Deputy Head Teacher, Miss Chris McGrail spearheaded the fundraising activities for the construction of the school building through the students and parents of Redhill, UK. The first section of the building was handed over to the Moragalla Junior School allowing them to increase its student intake. 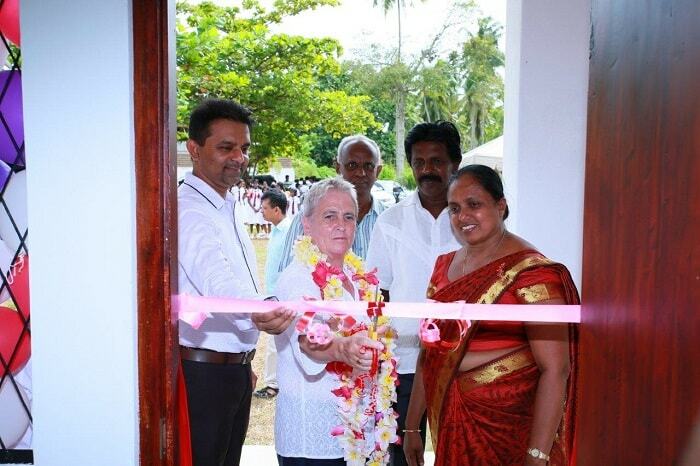 The opening ceremony took place recently under the patronage of Miss Chris McGrail, General Manager of The Eden Resort & Spa, Mr. Eksath Wijeratne, religious leaders, and the Principal of the school, Mrs. Kumarasiri. 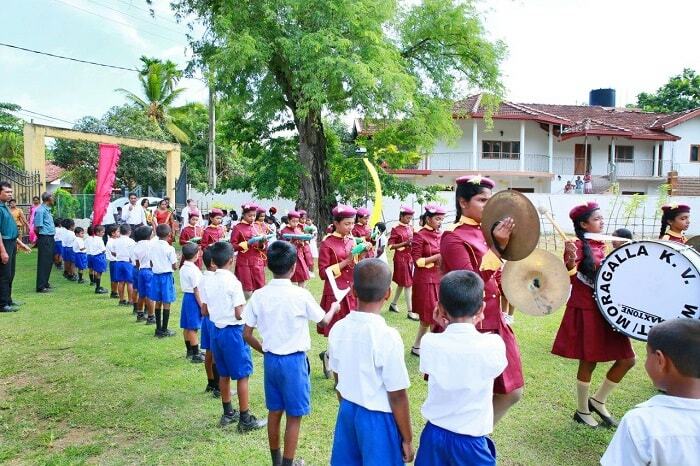 Teachers and students of the Moragalla Junior School, hoteliers of the Bentota-Beruwela region and members of the community were also present. Speaking at the opening ceremony, Mr. Eksath Wijeratne said, "Giving back to the community which we operate in is strongly aligned with the culture of our group (LOLC) and I am confident that this project will make a positive impact on many lives in this community and that it would be an immeasurable investment on the future of Beruwala. I take this moment to gratefully acknowledge the generous assistance extended to us by our honoured guest, Miss Chris McGrail as well as the students, parents and staff of the Redhill School UK for making this possible". Currently, the Moragalla Junior School provides education to 210 students, with 20 teachers and staff members on its cadre. In addition to the building project, The Eden Resort & Spa has provided financial assistance and held numerous educational programs aimed at providing greater educational facilities for the children of the Moragalla Junior School. 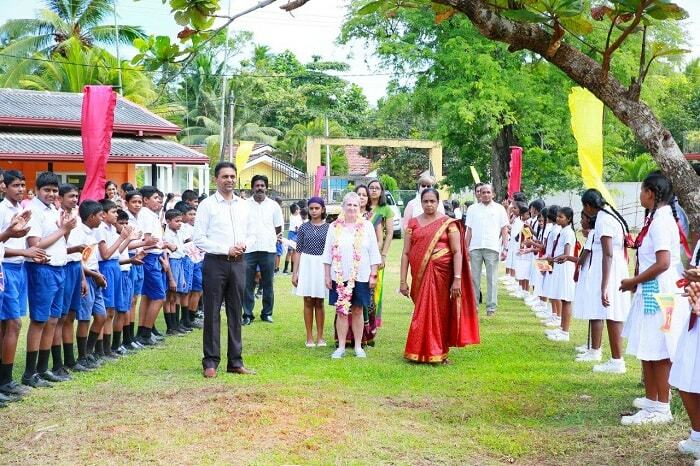 Miss Chris McGrail of Redhill UK, and General Manager of The Eden Resort & Spa, Mr. Eksath Wijeratne being welcomed by the students and Principal of the Moragalla Junior School. Al-Falaah, the Islamic Financial Services arm, brought glory and honour to LOLC Group by winning two Gold awards and one Silver at the 1st Islamic Finance Forum of South Asia (IFFSA) Awards 2016 which was organised by UTO EduConsult and adjudicated by KPMG Sri Lanka. In the country category, Al-Falaah, Islamic Business Unit of LOLC Finance won the Silver Award for the Islamic Finance Entity of the Year, Sri Lanka and a Gold for the Social Upliftment Award. Meanwhile, Mr. Nadheer Siddeeq of Al-Falaah Takaful of LOLC General Insurance Limited garnered the honours by winning the Gold Award for the &apos;Rising Islamic Finance Personality of the Year&apos;. 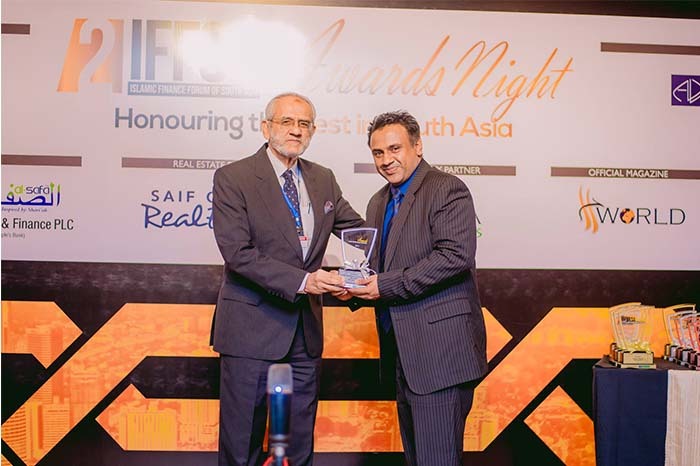 The 1st Annual IFFSA Awards ceremony recognised industry players from countries across the South Asian region including India, Pakistan, Bangladesh, the Maldives and Sri Lanka. The awards were evaluated and assessed by a panel of independent judges of repute and were presented country wise with a few awards bestowed on the intra-regional basis. Islamic Finance industry players were recognised against their peers in their respective countries, with some selected awards also being presented to players whose services span across the region. The inaugural IFFSA Awards 2016 was held alongside the first Islamic Finance Forum of South Asia which encompassed the entire South Asian region. The forum discussed the key challenges and the potential for Islamic Finance in the South Asian region as a bloc that comprises a large concentration of Muslims in the world. 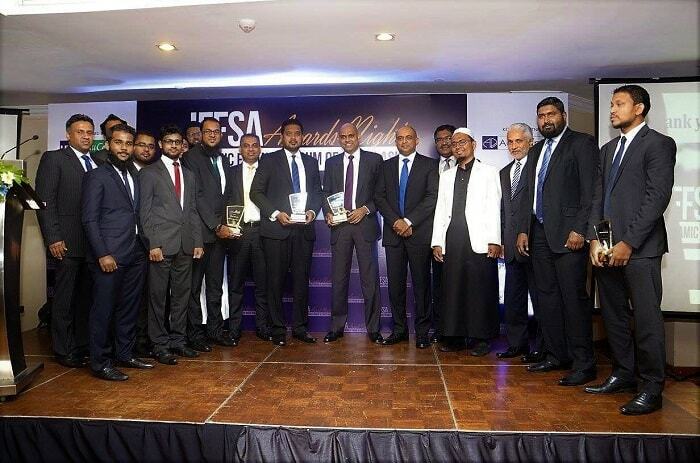 Commenting on Al-Falaah&apos;s win, Mr Krishan Thilakaratne, General Manager, Al-Falaah Islamic Business Unit of LOLC Finance said, "We are truly pleased to see our efforts in making a meaningful and broader impact on the Islamic Finance industry of Sri Lanka, being recognised in this manner. It is also heartening to see how the industry players in the entire South Asian region have come together to encourage and support each other whilst exploring new avenues for future growth". Also sharing his views, Mr Shiraz Refai, Assistant General Manager, Al-Falaah Islamic Business Unit of LOLC Finance said, "The concluded IFFSA conference and Awards featured some of the most prominent opinion leaders and industry contributors and players from the region. We take humble pride in being recognised as a key player and a socially responsible financier in the region and strive to add more value for all industry stakeholders both locally as well as regionally, going forward". Speaking about the Gold award won by Mr. Nadheer Siddeeq of Al-Falaah Takaful of LOLC General Insurance Limited, Nilanga Wickramasinghe Chief Operating Officer of LOLC General Insurance Limited and LOLC Life Assurance Limited said, "We are truly delighted and beyond proud of Mr. Siddeeq for being adjudged the Rising Islamic Finance Personality of the Year. This achievement has fully manifested the continuous effort and commitment of our staff and their focus on building long-term relationships with clients". Al-Falaah Takaful, the Takaful Business Unit was established in August 2014 and is operating directly under the patronage of LOLC General Insurance Ltd, which is one of Sri Lanka&apos;s fastest growing insurance companies. LOLC General Insurance Ltd is regulated by the Insurance Board of Sri Lanka (IBSL) and within a short span of 5 years has risen to be amongst the top leagues of the Insurance Industry. Mr. Shiraz Refai, Assistant General Manager, Al-Falaah Islamic Business Unit of LOLC Finance receiving the Silver Award for the 'Islamic Finance Entity of the Year, Sri Lanka'. Mr. Nadheer Siddeeq of Al-Falaah Takaful of LOLC General Insurance Limited was bestowed with the Gold Award for the 'Rising Islamic Finance Personality of the Year'. Mr. Shiraz Refai, Assistant General Manager, Al-Falaah Islamic Business Unit of LOLC Finance receiving the Gold Award for the 'Social Upliftment Award'. 28th July 2016. Colombo: The Insurance arm of the LOLC Group, one of Sri Lanka&apos;s fastest-growing companies in the Life and General insurance sectors, recorded a satisfactory half-yearly performance for FY2016. The Life insurance segment posted significant numbers by recording 73% growth in GWP in the first half of 2016 over the corresponding period in FY2015, which is an indicator that the Life Insurance business will most likely end this financial year on a sound note. The company closed first half of FY 2016 with an overall GWP growth of 47% over the previous year, recording Rs. LKR 2,537 Mn in GWP. The company&apos;s General Insurance business grew by as much as 37% over the previous year&apos;s first half. The company&apos;s Non-Motor business grew by 137% over the previous year&apos;s first-half result to record LKR 261 Mn. 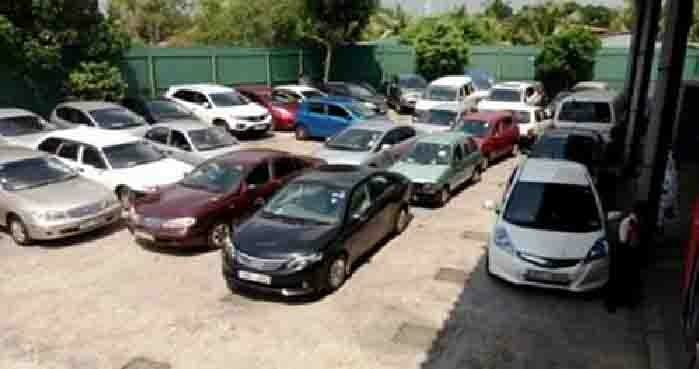 The Motor vehicle insurance business27% to record LKR 1,441 Mn in the first six months of 2016. 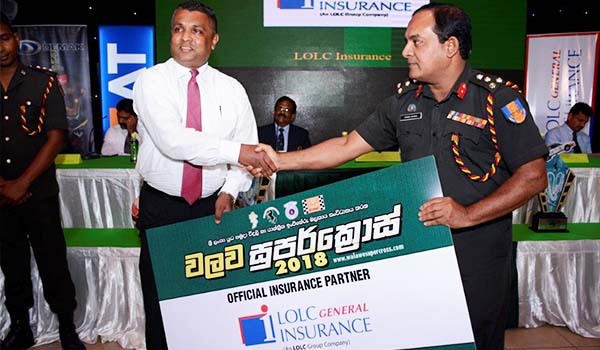 Commenting on the company&apos;s performance, the Chief Operating Officer of LOLC General Insurance Ltd and LOLC Life Assurance Ltd, Nilanga Wickramasinghe, said, "We are proud of our performance in the first half of the 2016 financial year. Our Insurance business has, within a short duration of five years, positioned itself on a competitive note in the industry, backed by a diverse portfolio. The company is led by a dynamic strategic plan, which clearly chalks out our goals and priorities. This performance can be attributed to the diversity of our product portfolio and the distribution endeavours through the Financial Services Sector, Personal Lines, Bancassurance, and Takaful Insurance backed by the powerful group synergies accorded by being part of the LOLC financial services platform. We note with gratitude the commitment displayed by our team of skilled professionals to achieve set financial targets and we have every reason to be optimistic about financial prospects for the rest of the financial year." 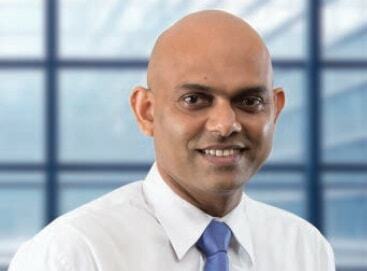 Wickramasinghe went on to add that the insurance sales force of both Life and General companies is poised to further penetrate the segment in the year ahead via all channels. The company offers customers access through 173 outlets in the LOLC Group&apos;s network. The strength and stability of the LOLC Group has strongly served to boost the standing of its Insurance arm amongst customers. Further, the company is backed by a leading reinsurance partner Munich Re amongst others who support its operations. 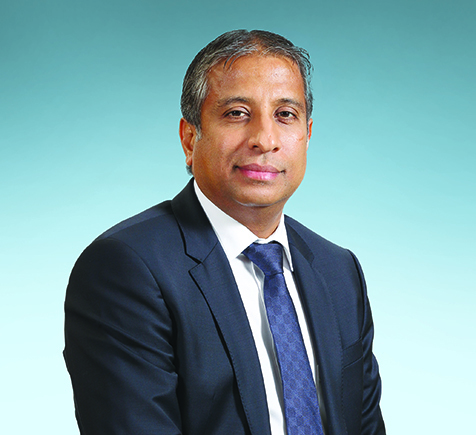 Kapila Jayawardena, Group Managing Director/Chief Executive Officer (CEO), LOLC Group, commented, "I am proud to see the Group&apos;s Insurance arm performing in a reasonable manner, to match the stature of the other LOLC financial services companies, each of which leads in its sphere of specialization. I must commend the Team for their strong focus on growing the company&apos;s market share whilst aptly balancing conventional insurance with innovation and effective delivery of services. The insurance company has brought together a team of experienced and dynamic insurance professionals who are eager to expand the product and service portfolio of the company while widening its geographical reach. The company can avail of strong group synergies and resources of the LOLC Group. Thus far, the company has evolved well even post-segregation, while maintaining the growth momentum." 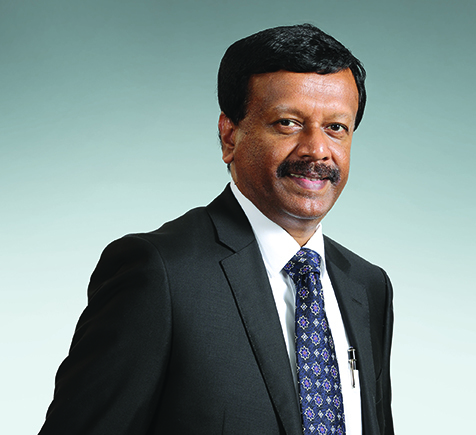 Group Managing Director/Chief Executive Officer, LOLC Group & Chairman, LOLC General Insurance, Mr. Kapila Jayawardena. 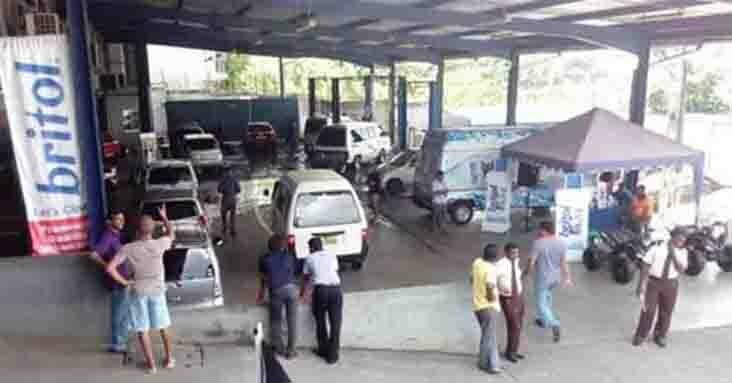 Sri Lanka&apos;s first ever Auto Spa organised by LOLC Motors Limited (LOMO) was conducted on a grand scale recently. The inaugural LOLC Motors Auto SPA 2016 was a runaway success with over 200 vehicles receiving the best interior and exterior car care facilities under one roof by some of the leading local and international car care brands. 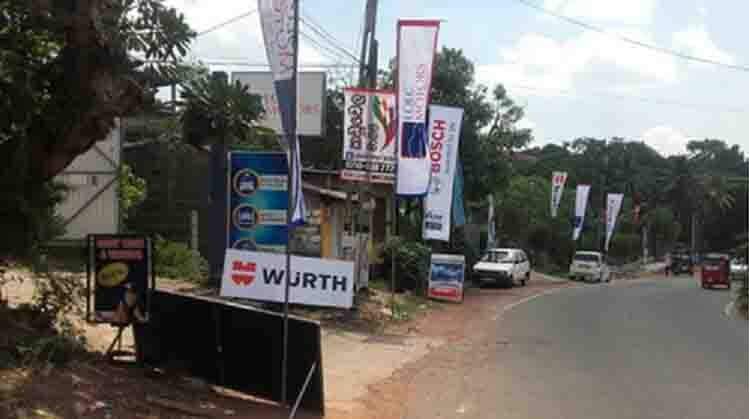 This unique Auto Spa was held at the LOLC Motors premises located in Gothatuwa over two days. Customers were offered the best in flexibility, customer service and technology at the LOLC Motors Auto SPA 2016 with discounts up to 25% on all repairs and services during the two-day Auto Spa. Various car care services were offered by renowned brands such as Mobil, Bosch, Britol, Wurth and BG car products. Body wash and vacuum, scanning and inspection report services worth Rs. 2,500 were offered by LOLC Motors. 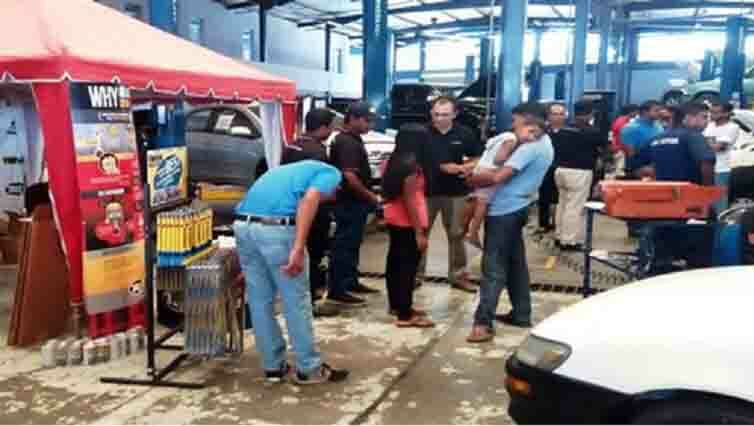 While their automobiles got pampered, vehicle owners were also offered free eye check-ups by optometrists and cataract testing from Suwanetha Lions eye hospital. Eye testing for spectacles and glaucoma treatment were also offered free of charge for customers who visited the LOLC Motors Auto SPA. Overall, each customer received approximately Rs. 14,000 worth services absolutely free. Commenting on the success of the LOMO Auto Spa, Ms. Mehra Mendis, DGM of LOLC Motors Ltd said, "We have received a very good response for the Auto Spa and we are delighted to see the enthusiasm of our existing and new customers. I would like to congratulate the LOMO team for organising the first ever Auto Spa and thank all our valued customers for participating and making it a resounding success." Ramesh Kariyawasam, Head of Operations of LOMO said, "We hope to organise many similar events in the future with the aim of offering our customers the best of convenience and care. At LOLC Motors we will continue to service our customers quickly, efficiently and with attention to detail." LOLC Motors Limited, a subsidiary of the LOLC Group, is an ISO/9001:2008 certified automotive workshop specialising in vehicle repair and maintenance services of automobiles. 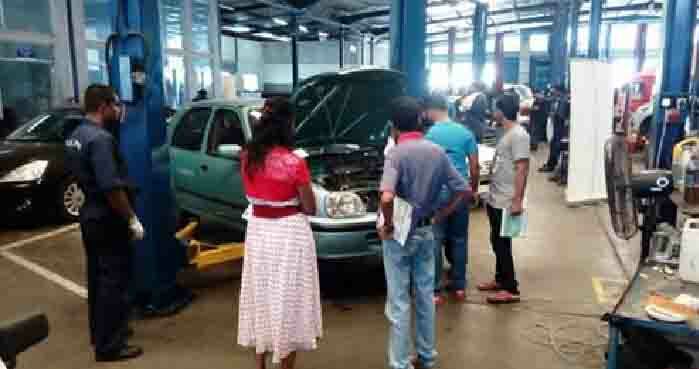 It is one of the largest automotive workshops in Colombo, with a floor space of 5,600 sq. metres. The contemporary, eco-friendly workshop is equipped to handle over 100 vehicles at any given time. The workshop offers a wide range of automobile services including mechanical repairs, preventive maintenance, paint refinishing or touch-ups, quick lube service, lubrication service, collision repairs, wheel-alignment, wheel-balancing unit repairs and many more. The workshop is equipped to service 750 vehicles per month, including hybrids with the services of a qualified and experienced team of engineers, supervisory staff and highly skilled technicians. With a combination of modern technology and world class service, LOMO has successfully been able to reduce the turnaround time for repairs, in collaboration with the relevant insurers. 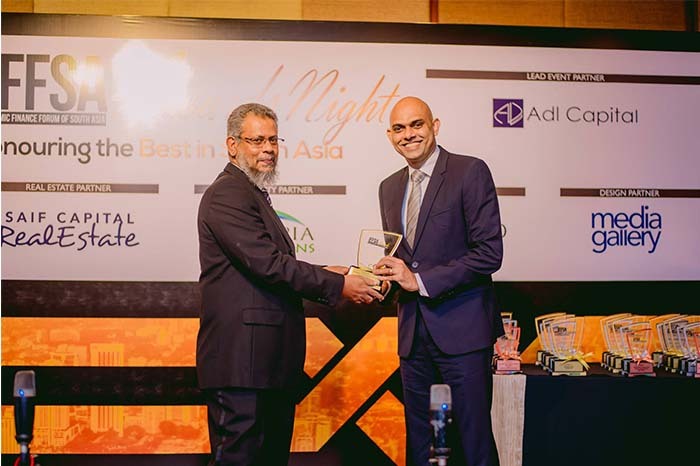 Al-Falaah, the Islamic business unit of LOLC Finance PLC, brought honour to Sri Lanka and the LOLC Group, when it received recognition on one of the top award categories at Redmoney&apos;s Annual Global Awards - Islamic Finance News (IFN) Best Banks Poll 2015. Al-Falaah was adjudged Runners-Up in the category of "Best Islamic Leasing Provider (Overall) 2015", whilst the Gulf International Bank of Bahrain clinched the top spot. The awards-giveaway ceremonies took place in February this year with the Asian awards ceremony scheduled and the Middle-East awards being held in Kuala Lumpur and Dubai respectively. The annual Islamic Finance news Best Banks Poll recognizes the industry leading providers of Islamic financial services across global markets and varied sectors, where votes casted by readers of Islamic Finance News, Islamic finance investors, issuers, banking & non-banking financial intermediaries as well as regulatory and government bodies being invited to participate in the process. Voting takes place during December each year and the results are announced by the first week of January. This year&apos;s poll has attracted a record number of over 30,000 votes exceeding the 10,000 votes received last year. Financial institutions representing Europe, The Americas, Africa, South East Asia, Asia Pacific and the Indian Sub-Continent as well as the Middle East were featured in this global annual poll. Speaking about this prestigious win, Mr. Krishan Thilakaratne, General Manager, Al-Falaah Islamic Business Unit of LOLC Finance said, "Al-Falaah has re-established its brand strength yet again as the most trusted and reliable non-bank Islamic financial service provider in Sri Lanka. To be recognized at global level is indicative of its appeal beyond the shores of Sri Lanka and the confidence our overseas investors and customers have of Al-Falaah. We are indeed proud of this recognition." Also sharing his views, Mr. Shiraz Refai, Assistant General Manager, Al-Falaah Islamic Business Unit of LOLC Finance said, "We have been featured at IFN-Awards on multiple occasions over the past years. This is due to the acceptance of our commitment to offer reliable and innovative Islamic Finance Solutions by our valued customers. Their confidence placed with us from inception establishes the reliability and superior service levels that we continuously strive to offer our valued customers. We are extremely pleased with the results and take humble pride in representing Sri Lanka in a global platform. This is the fourth consecutive year that Al-Falaah was recognized at the top-tier ranks at the IFN Best Banks Poll. I thank our loyal customers, stakeholders and employees of Al-Falaah and LOLC for their steadfast trust and commitment to our products, services and values. I also commend the efforts taken by industry peers in continuously upholding the standards of Islamic Finance." 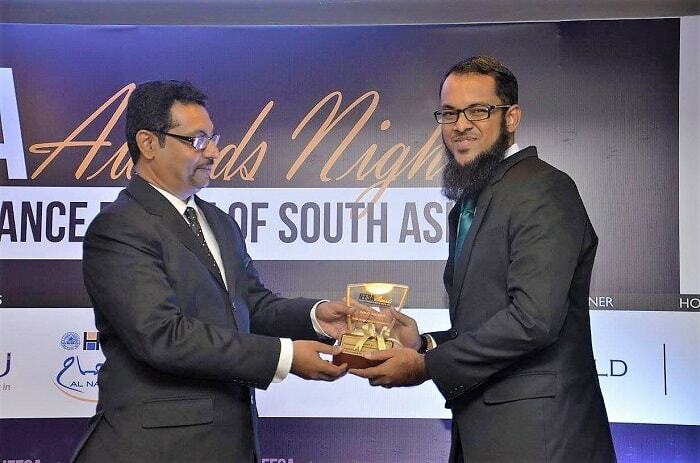 On home soil, Al-Falaah, clinched the top Gold award for being adjudged the &apos;Islamic Finance Entity of the Year 2014&apos; at the 4th Sri Lanka Islamic Banking & Finance Industry (SLIBFI) Awards and the top award for the &apos;Social Upliftment Award (CSR)&apos; category. Al-Falaah, established in 2007 functions directly under the auspices of LOLC Finance PLC, which is one of Sri Lanka&apos;s largest non-banking financial institutions. LOLC Finance which is a regulated Finance Company of the Central Bank is rated [SL] A with stable outlook by ICRA Lanka Limited, a wholly owned subsidiary of ICRA Ltd - an associate of Moody&apos;s Investors Service. This funding amount represents a significant national milestone, as it includes the largest syndication of the Non-bank Financial Institution sector in Sri Lanka. A USD 153.1 million loan was granted to Commercial Leasing and Finance PLC, through FMO (Financierings Maatschappij Ontwikkelingslanden), the Dutch Development Bank that provided the loan and acted as Mandated Lead Arranger and Facility Agent. The loan consists of a senior loan of USD 39.2 million from FMO and a USD 113.9 million syndicated loan from 11 distinguished funding partners for Commercial Leasing & Finance PLC (CLC). The 11 partners are: The OPEC fund for International Development (OFID) (USD 20 million); Finnfund- the Finnish Fund for Industrial Cooperation (USD 11 million); Proparco - a subsidiary of the Agence Francaise de Developement (AFD) (USD 10 million); BIO - the Belgian Investment Company for Developing Countries (USD 7 million); DEG - the German Investment and Development Corporation (USD20 million); OeEB the Austrian Development Bank(USD 10 million); responsAbility Investments AG (USD 12 million); Blue Orchard Finance (USD 10.1 million); Symbiotics (USD 9.0 million) and Dutch Oikocredit (USD 5 million). ACTIAM also participated by providing USD 5 million via FMO&apos;s fund structure. Speaking on the occasion, Linda Broekhuizen, Chief Investment Officer of FMO, said, "FMO is proud to act as Mandated Lead Arranger and Facility Agent of this USD 153 million facility. It is encouraging to see so much commitment to job creation and economic growth, both among the other lenders and CLC. FMO is particularly proud to lead this facility for the LOLC Group, with which we have a long lasting relationship for more than 25 years. LOLC Group&apos;s efforts to strengthen small businesses and entrepreneurship in Sri Lanka is an important basis for sustainable economic development and lasting improvement of people&apos;s living conditions in the country." In addition to the syndicated loan transaction, FMO - in partnership with other lenders in the syndicate - is committed to supporting CLC with a tailored technical assistance programme to further strengthen CLC&apos;s operation standards. The technical assistance includes capacity building in the area of Asset and Liability Management, environmental, social and governance standards, client protection principles and a management development program focused on leadership and skill training for employees. LOLC Finance PLC received a USD 69 million loan consisting of USD 30 million from the Asian Development Bank (ADB) and a USD 39 million syndicated loan from prominent Middle Eastern banks. Transcending business, this is also a symbolic moment in multilateral relations, as this is the first syndicated loan from a consortium of Middle Eastern banks to the NBFI sector Sri Lanka. The ADB syndication of USD 69 million to LOLC Finance PLC is structured in two tranches: Tranche A is for a period of 7 years and has been funded by ADB; and Tranche B is for a period of 3 years and has been funded by Emirates NBD Bank, Bank Muscat, First Gulf Bank, National Bank of Oman and Rakbank. ADB has acted as a Lender of Record for both the tranches, with Bank Muscat and First Gulf Bank as the Mandated Lead Arrangers for Tranche B, while Dubai Based Investment Bank, Alpen Capital ME Limited acted as the financial advisor. LOLC Micro Credit Limited, the largest microfinance company in the country, received a USD 25 million senior loan from ADB, making it the single-largest loan received by the company in the present financial year. In addition to the loan transaction, ADB will also provide a technical assistance package to LOLC Micro Credit Limited and LOLC Finance PLC, comprising mobile banking support and the development of Environmental and Social Management Systems. Over the years, these programs have played a vital role, supplementing funding assistance by providing LOLC with the training in the technology and procedures required to maintain their standing at the top level of the Sri Lankan finance industry. "ADB is very pleased to partner with LOMC and LOLC Finance to provide long-term funding to micro-entrepreneurs and SMEs- critical segments of the Sri Lankan economy. The ADB loans build upon our relationship with the LOLC Group, which was initiated with a loan in 2007. It also complements other funding that ADB has done recently to support growth of the private financial sector in Sri Lanka. In addition to senior loans, ADB partnered with a consortium of leading Middle Eastern Banks to provide a B loan to LOLC Finance to meet their expanding needs," said Christine Engstrom, Director for Financial Institutions at ADB&apos;s Private Sector Operations Department. The Honourable Minster of Finance of the Government of Sri Lanka, Mr. Ravi Karunanayake, in his statement, said: "On behalf of the Government of Sri Lanka, I would like to thank the overseas partners in this landmark transaction for placing their confidence in the LOLC Group. This is a proud occasion not just for the LOLC Group but for the country as a whole. These loans will greatly assist the macroeconomic environment, thereby restoring the confidence, stability and growth required as Sri Lanka is entering a new chapter in its economic development and we are optimistic that more investor interest of this magnitude will further fuel the nation&apos;s progress. I would like to commend LOLC for tirelessly assisting in the development of the SME and Micro Segment activities, and for its success in securing this funding. The most efficient economic policies cannot completely eradicate uncertainties that a country faces, as borrowings from domestic and international markets are a necessity for economic progress. The government is making a strong effort to bridge the financial deficit and drive public finances on a sustainable path, and FMO, ADB and its consortium of partners need to be recognized for the great role they play in transforming the nation&apos;s future." Commemorating this landmark syndication, the Group Managing Director of LOLC Group, Mr. Kapila Jayawardena said, "We are pleased to be the recipients of near a quarter billion dollars by renowned Development Financial Institutions (DFIs) around the world. The group has one if not the largest array of international funding partners. These institutions consider LOLC Group as their preferred conduit in achieving their development and commercial goals. Over the years these partnerships have expanded and strengthened and contribution extends beyond funding. Our foreign partners have offered us invaluable assistance ranging from capacity building to exposure to global standards over the years, which has enabled us to achieve operational excellence offering the competitive edge. With such a strong platform as the long-lasting relationships we have created with the funders, I hope to see our Group harness our strengths and further promote our vision, especially in the micro and SME sector; inclusive, sustainable growth and flourishing prosperity for all Sri Lankans".